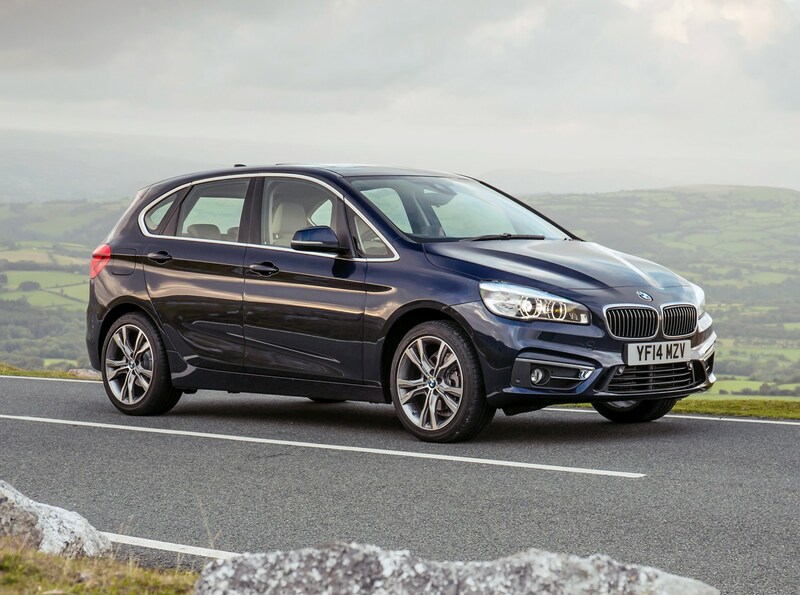 Which BMW 2-Series Active Tourer is best for me? 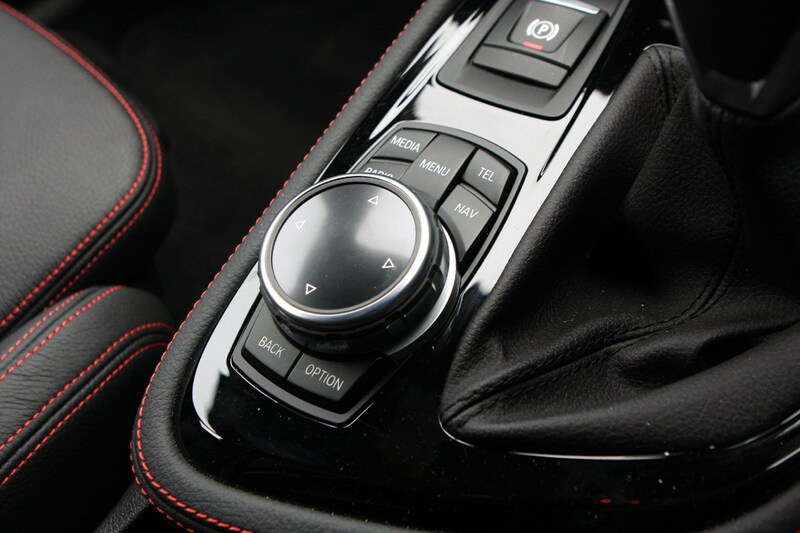 Announced in January and driven in May 2018, the new seven-speed dual-clutch automatic gearbox BMW also uses in the MINI Hatch and Convertible works perfectly for most types of driving. 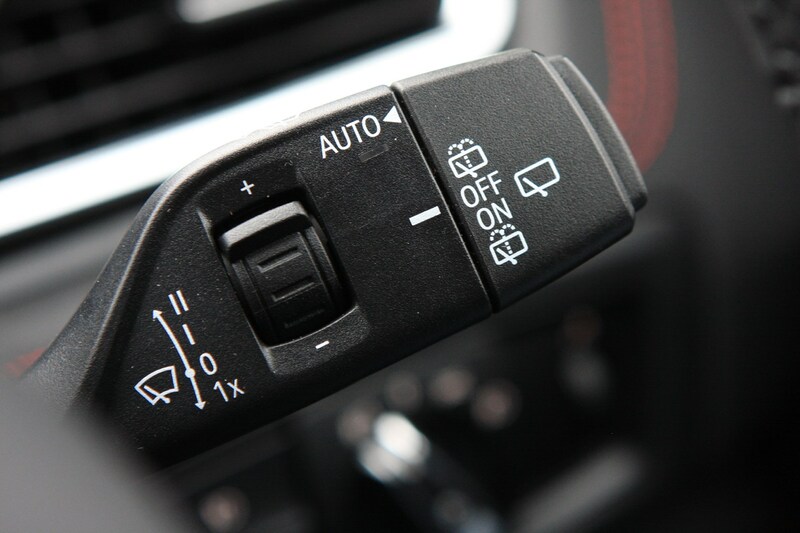 Changes are quick and almost seamless, with manual control via the gearlever if required – for towing or in more extremely off-road situations. 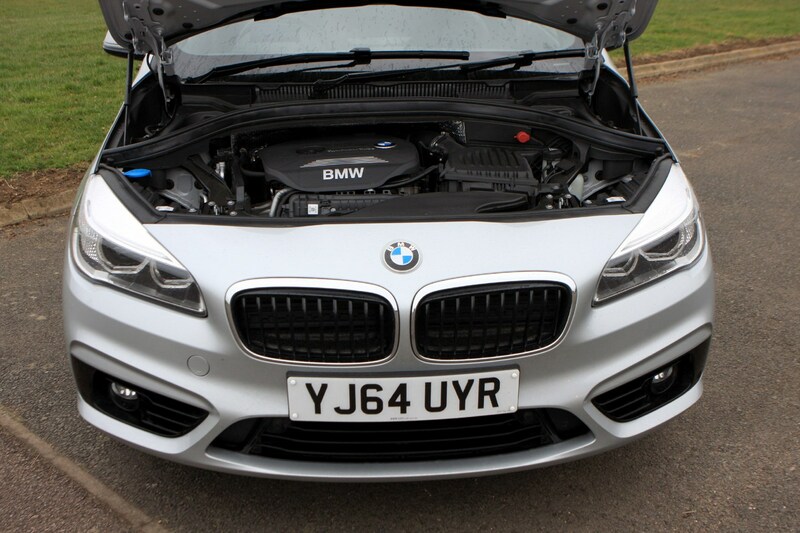 Our only slightly criticism was a very minor thing relating to the way the engine marries with the gearbox, whereby on very light throttle application at low speeds there’s a hesitation before power arrives. 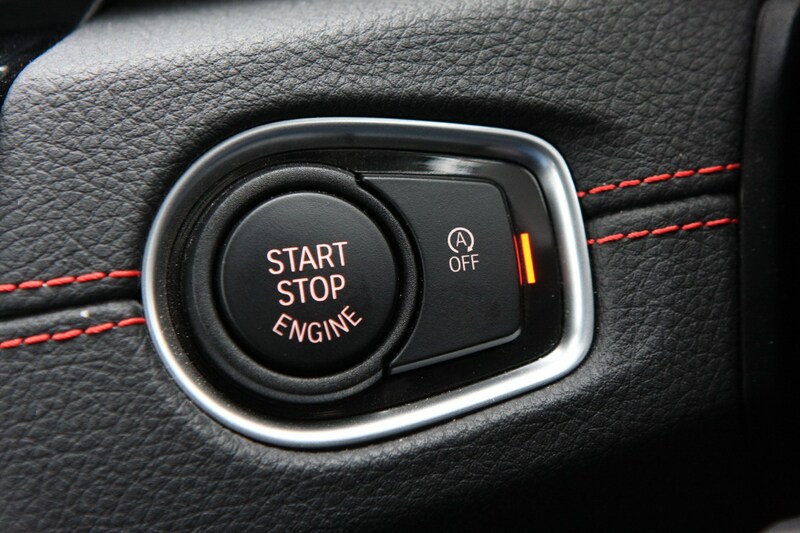 It feels like the engine wants to stall – the situation in a manual car when engine speed drops so far it can’t continue spinning, and stops. 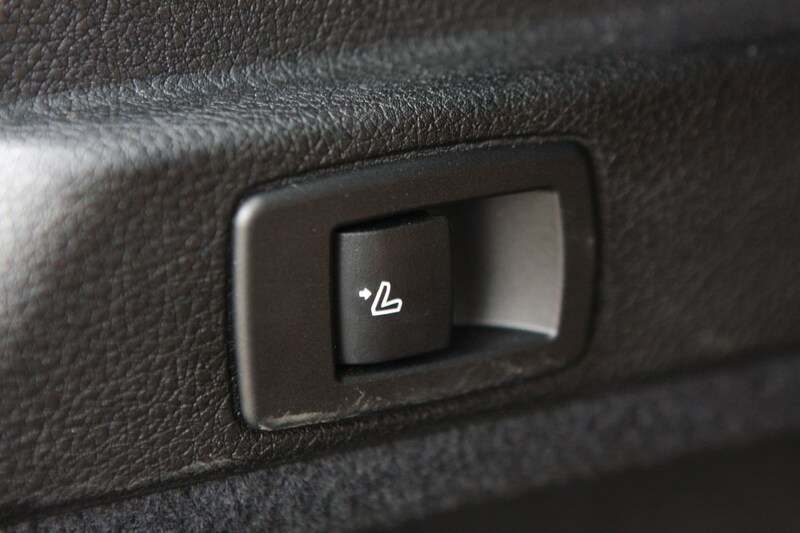 This never happens, but it feels a little worrying all the same. 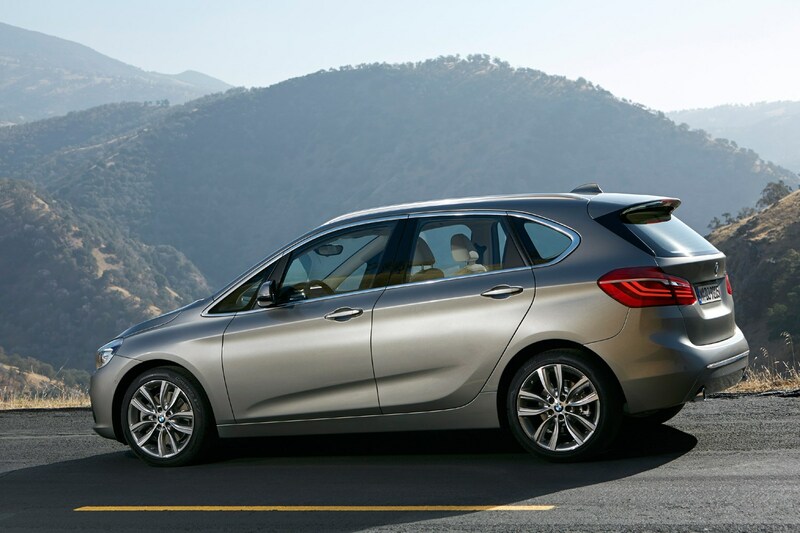 In a bid to provide every kind of powertrain possible, BMW’s first front-wheel drive compact MPV is now available with a plug-in hybrid set-up, combining a three-cylinder 1.5-litre petrol engine with an electric motor to form this – the 225xe Active Tourer. 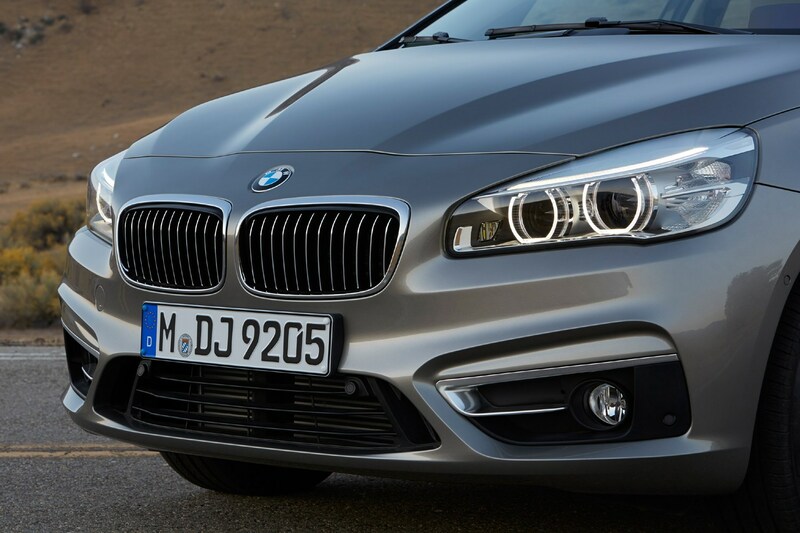 As the name suggests, the 225xe comes with xDrive all-wheel drive. 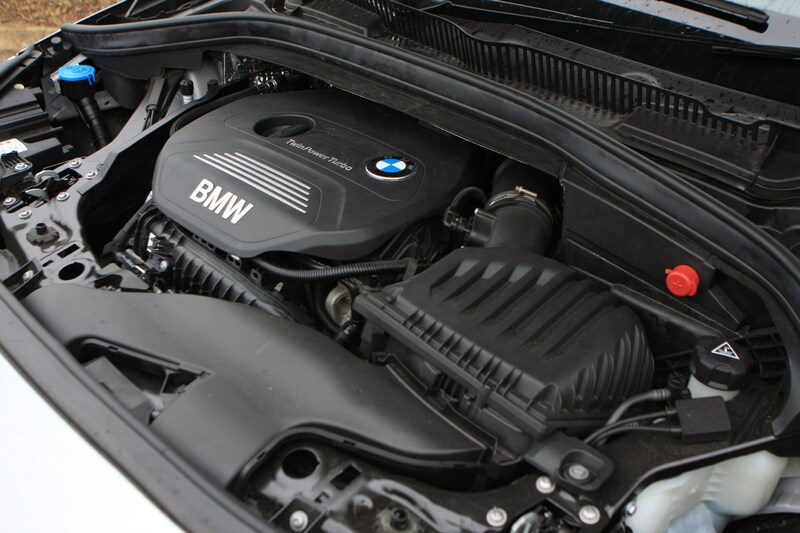 The 1.5-litre three-cylinder petrol engine from the MINI Cooper Hatch, also found in the 218i, powers the front wheels, while an electric motor powers the rears. 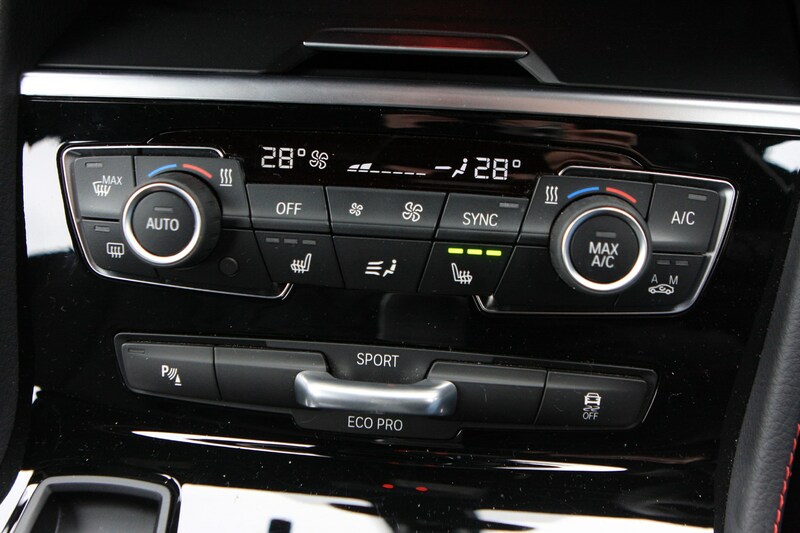 The 225xe produces 224hp and 220Nm of torque in normal driving, although a total of 385Nm of torque is on tap when you put your foot down and the engine and electric motor work in unison. 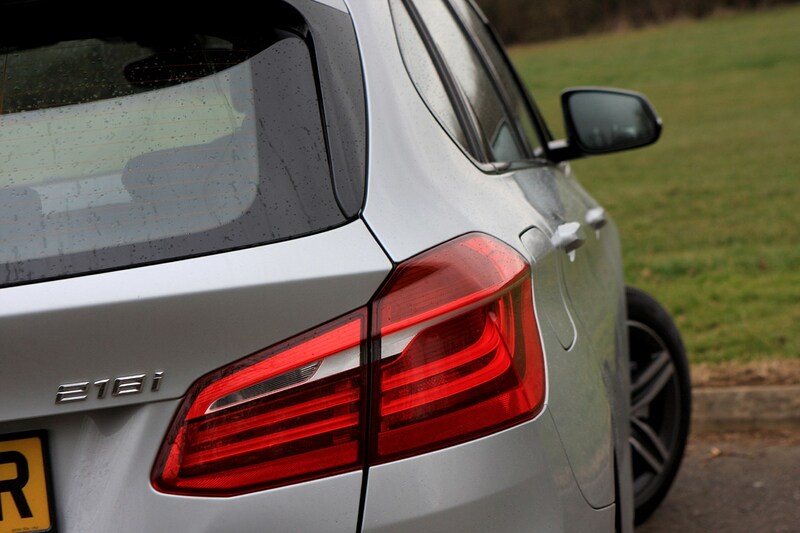 It gives the 225xe a surprising turn of speed, but we’ll come onto that later. 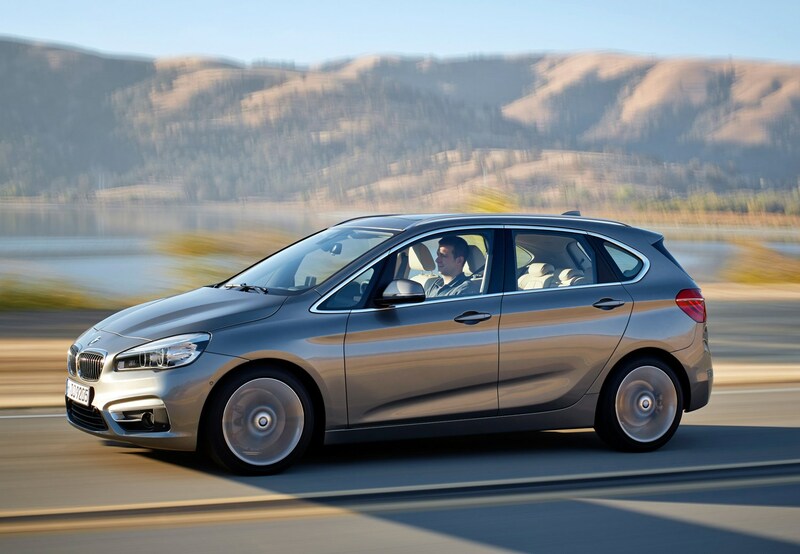 The 225xe boasts the lowest claimed economy figures in the whole Active Tourer range. 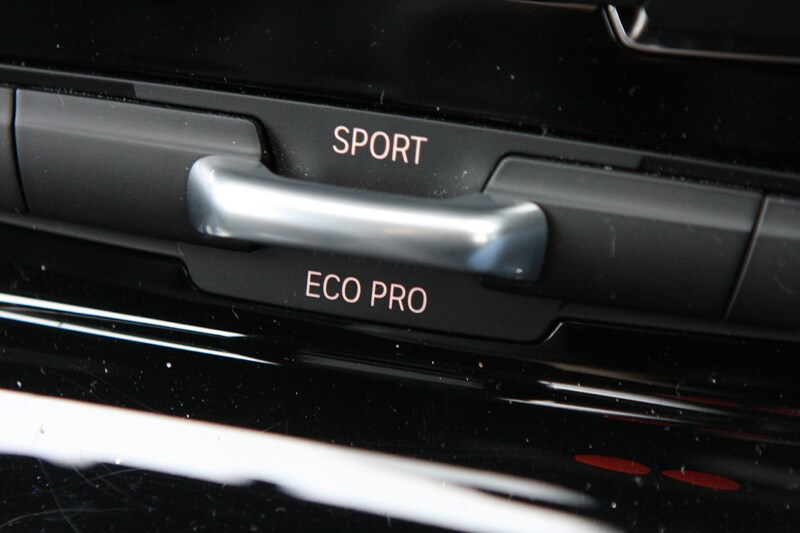 CO2 emissions range between 46 and 49g/km depending on the trim level and alloy wheel size (there’s Sport, Luxury and M Sport trims to choose from). 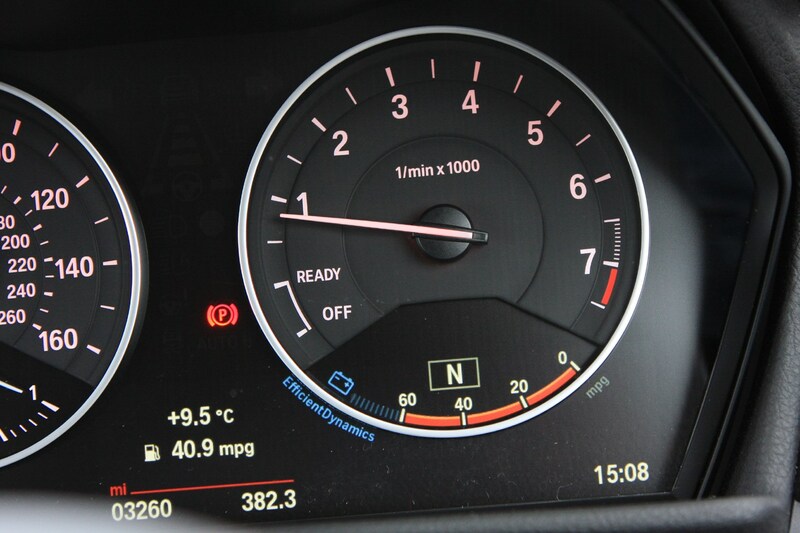 Claimed fuel economy is between 134 and 141mpg, again varying depending on trim and wheel size, although if the battery runs out you can expect to average somewhere in the mid-50s in normal driving on petrol power alone. 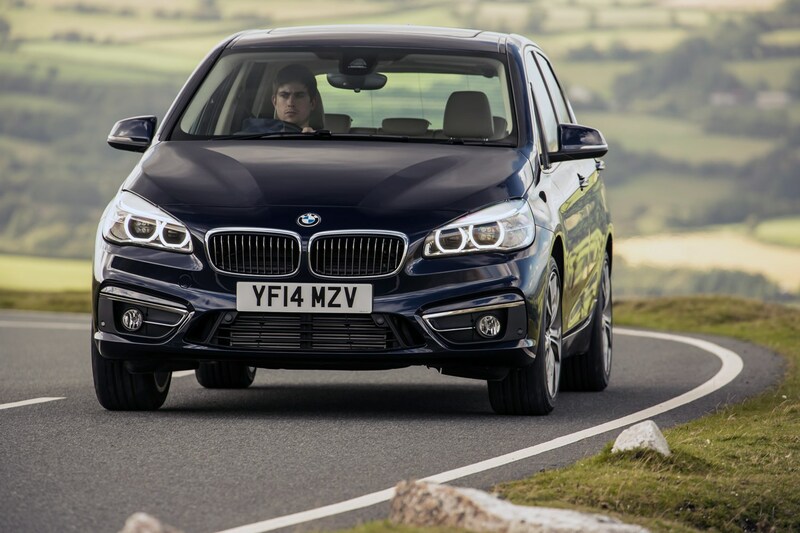 Using only electric power, the 225xe is capable of travelling for around 28 miles before the battery is depleted, so most everyday journeys (in theory) could be undertaken in the silence of pure electric mode. 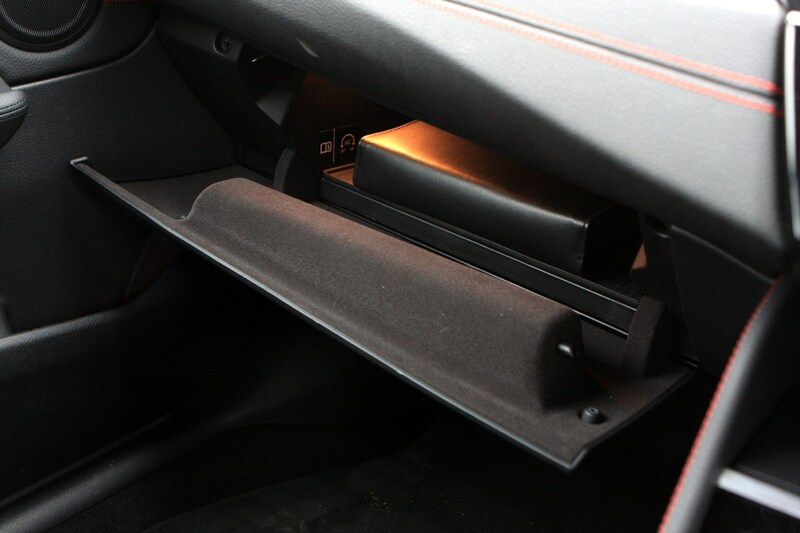 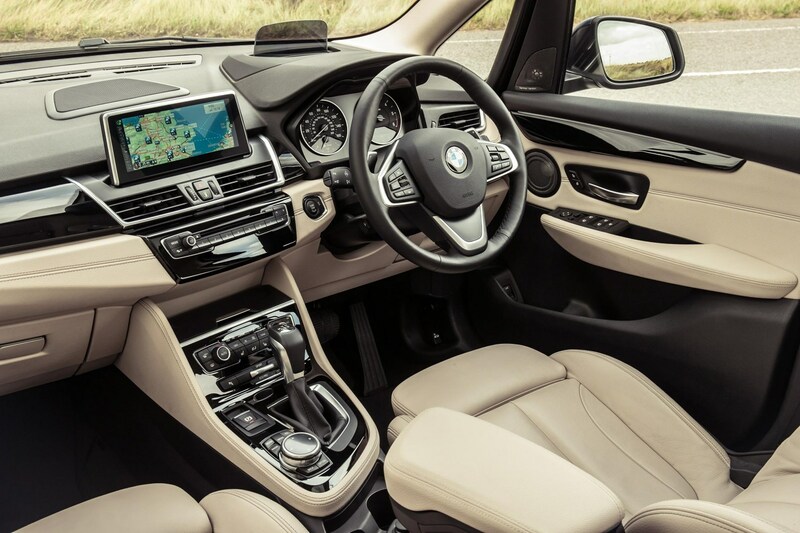 In terms of charging, the 2 Series’ batteries can be replenished from empty via a normal domestic plug socket in three-and-a-quarter hours, while a dedicated BMW iWallbox cuts this to two hours and twenty minutes. 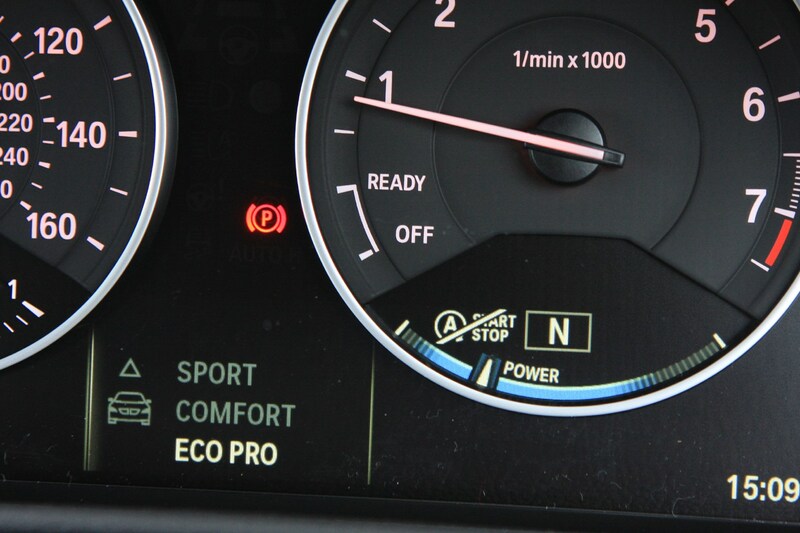 Depending on the driving mode selected, energy recuperated from braking feeds into the battery to keep it topped up too. 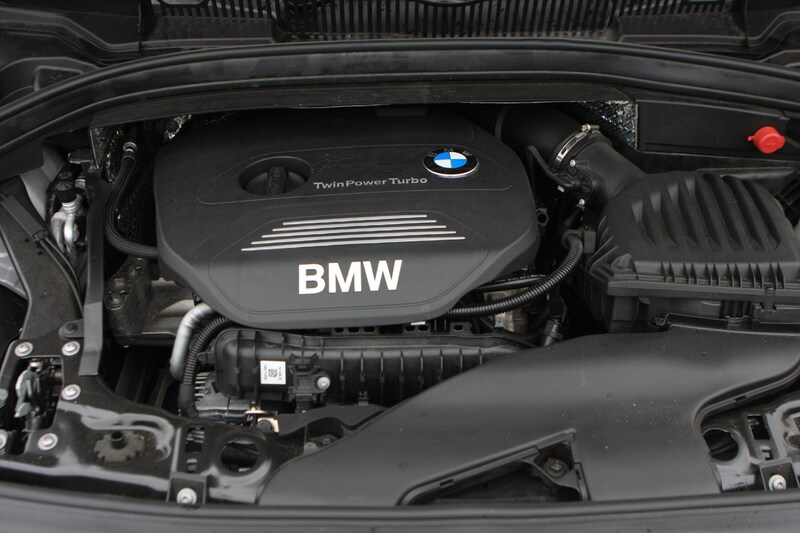 Does it still drive like a BMW? 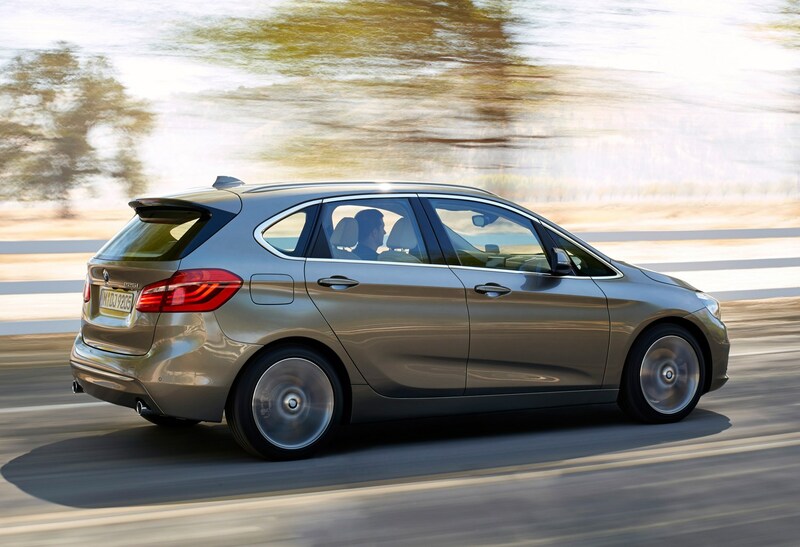 This version of the 2 Series Active Tourer certainly has the performance you’d expect from a brand producing ultimate driving machines and as ever, there’s a range of driving modes for you to choose from to extract either the most performance or the most miles out of the car – Sport, Comfort and Eco Pro. 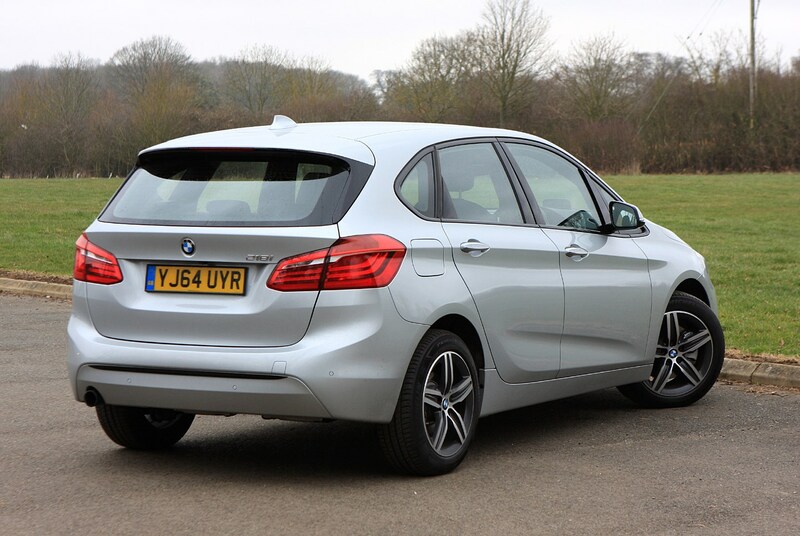 Most drivers will leave it in Comfort, and that’s what we’d do as well – it’s the best all-round set-up for a practical people-carrier that’s mostly used around town. 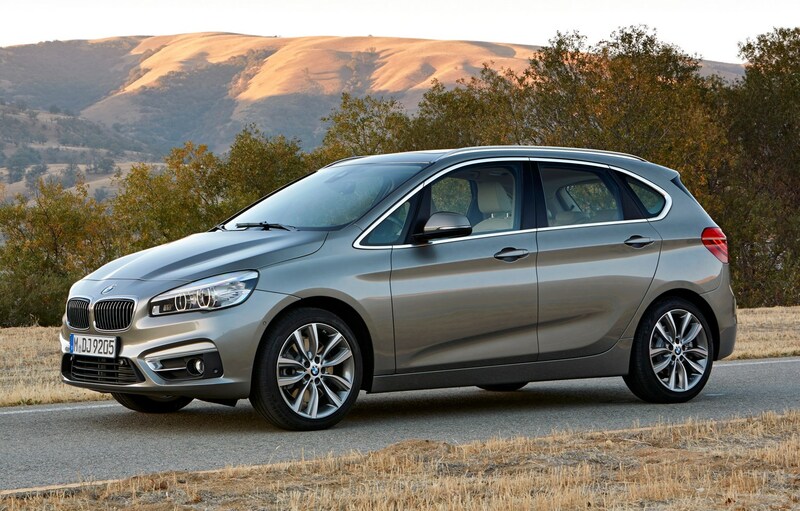 If you’re after one of the sharper-driving MPVs on sale, the 2 Series Active Tourer should be near the top of your list – bodyroll is kept in check pretty well and performance is strong in this version, although the ride is a little on the firm side which may put off family buyers who prefer comfort to cornering ability – a Citroen C4 Picasso is a much more cosseting choice. 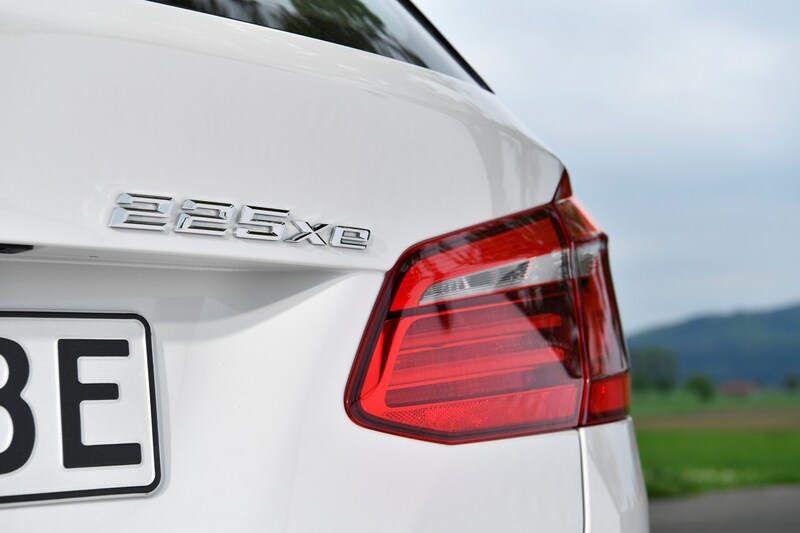 The plug-in hybrid powertrain adds a bit of weight over regular petrol and diesel versions, but the 225xe will go from 0-62mph in 6.7 seconds – only the petrol 225i xDrive beats this by 0.4 seconds. 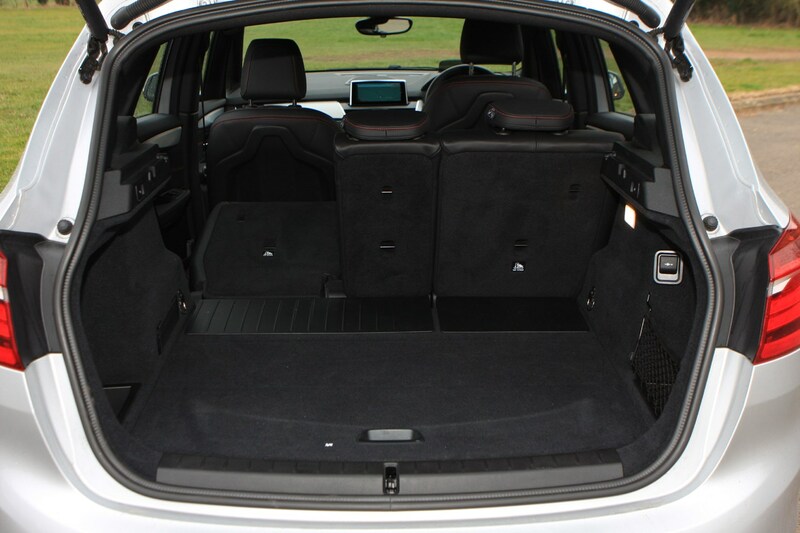 This burst in performance is aided by the combination of petrol engine and electric motor, which can also be controlled via three eDrive set-ups for the hybrid powertrain. 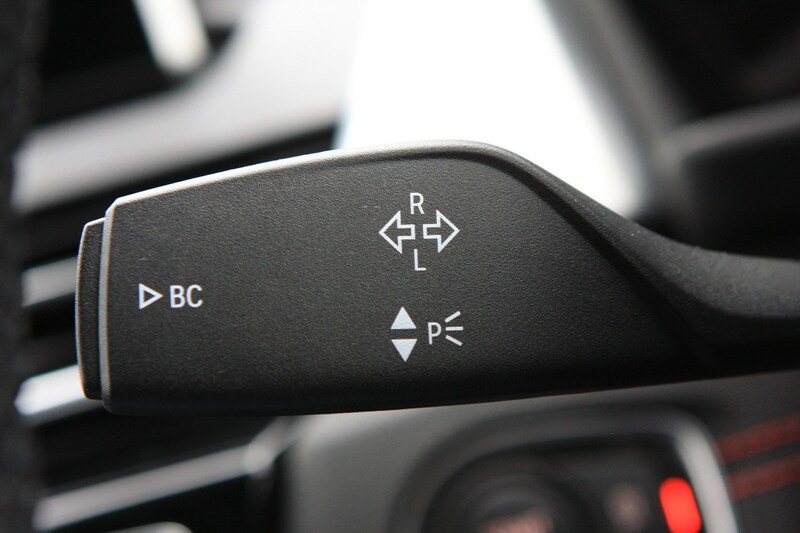 The car defaults to Auto eDrive, which sets the car up to run on electric power as much as possible at speeds of up to 50mph. 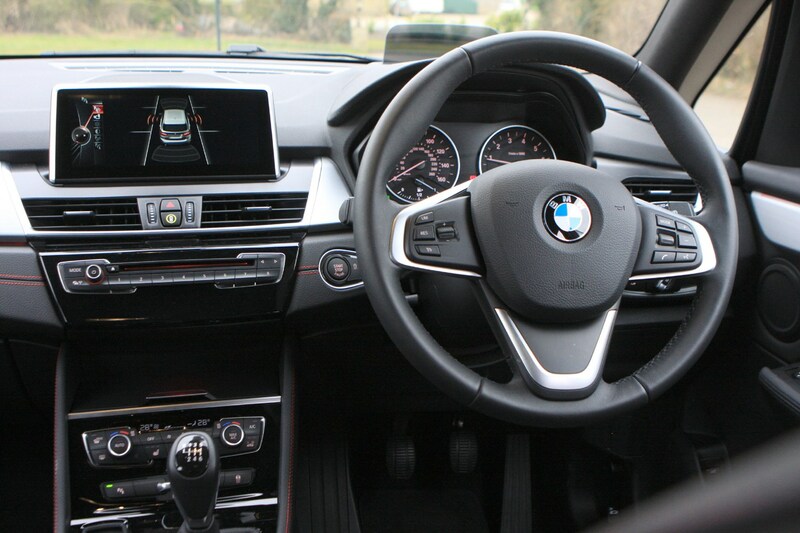 The petrol engine kicks in when more power is needed or if the battery is low on charge, and does so seamlessly too, leaving the 2 Series a refined place to spend time in, with a smooth six-speed automatic gearbox too. 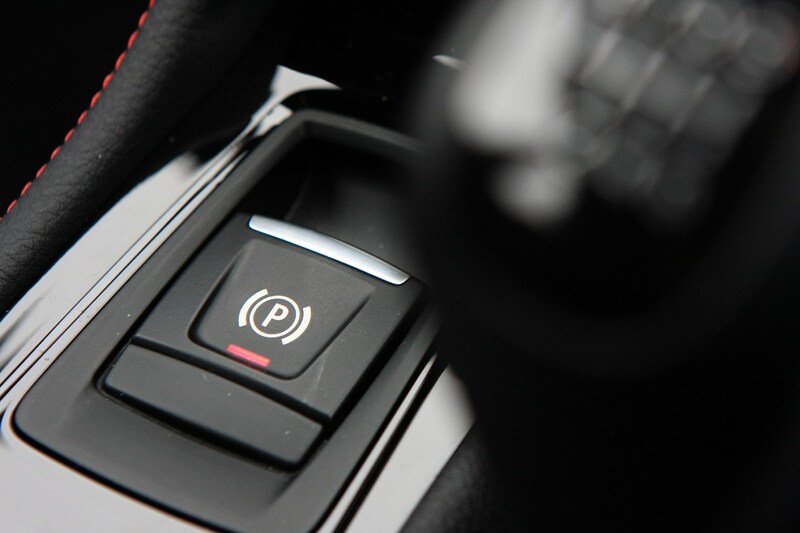 Drop it into Max eDrive mode to drive around on pure electric power up to 78mph, while Save Battery mode – unsurprisingly – ensures the reserves remain for silent motoring later on. 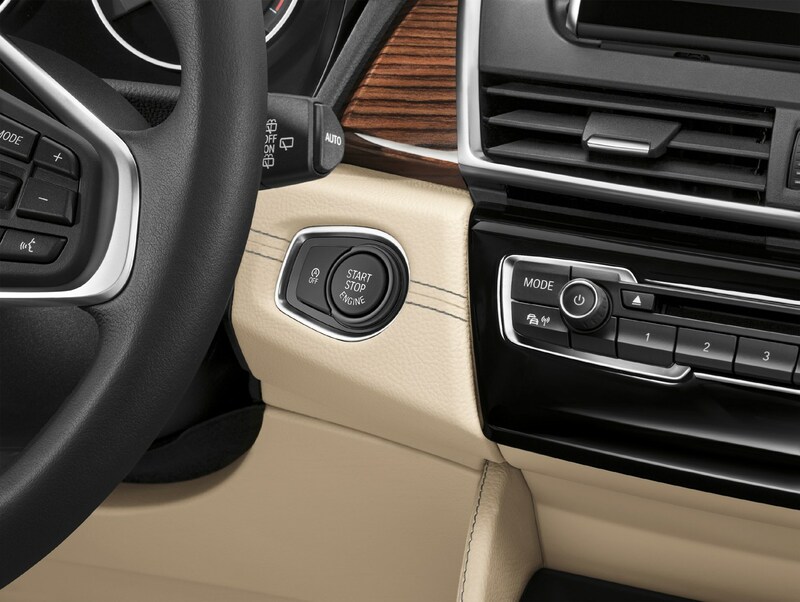 In operation, the 225xe switches between running on electricity and with the engine smoothly – you only really notice an audible difference when you really put your foot down and demand a bit of extra pace. 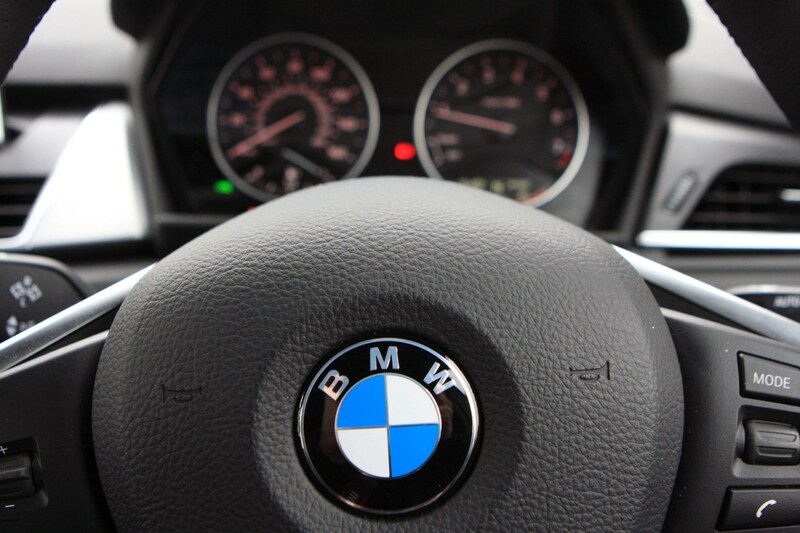 At all other times it remains a peaceful car to drive. 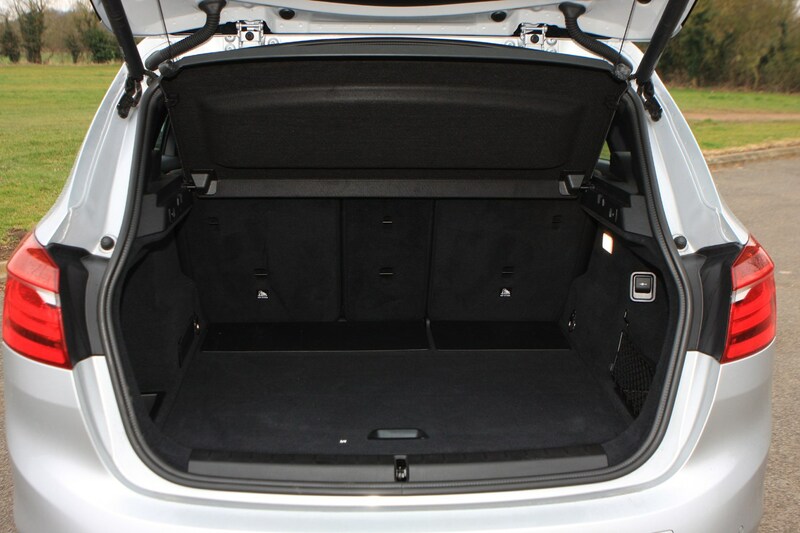 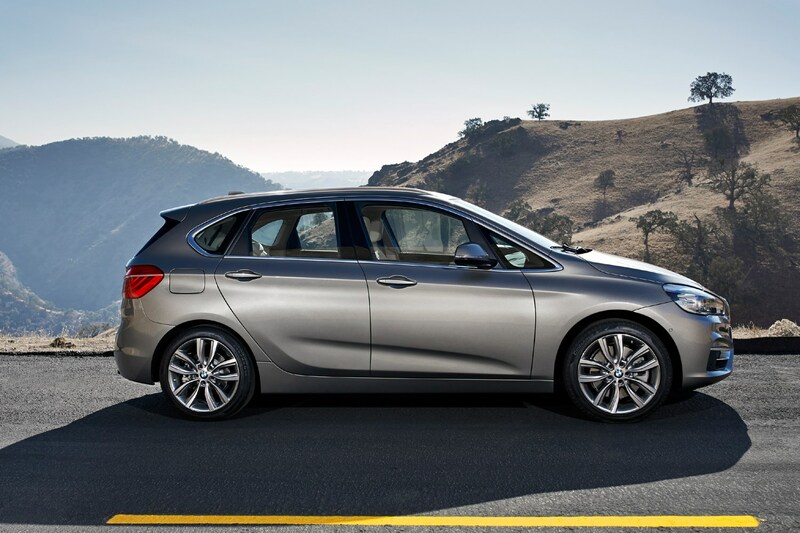 The standard 2 Series Active Tourer features a 468-litre boot, but the electric motors and xDrive all-wheel drive system eat into boot space slightly. 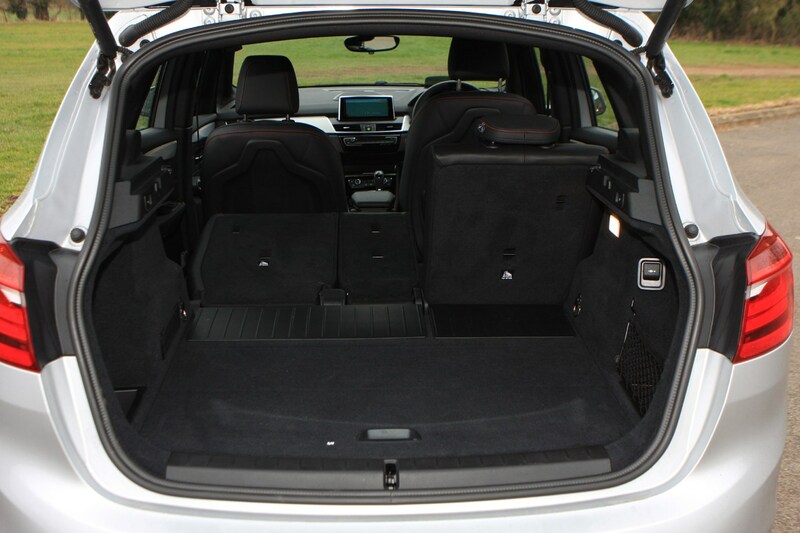 It reduces seats-up capacity to 400 litres, but this is still good compared to some fully-electric cars with much smaller boots, plus the rear seats can be folded flat at the touch of a button and access is easy thanks to a wide tailgate opening and low loading lip. 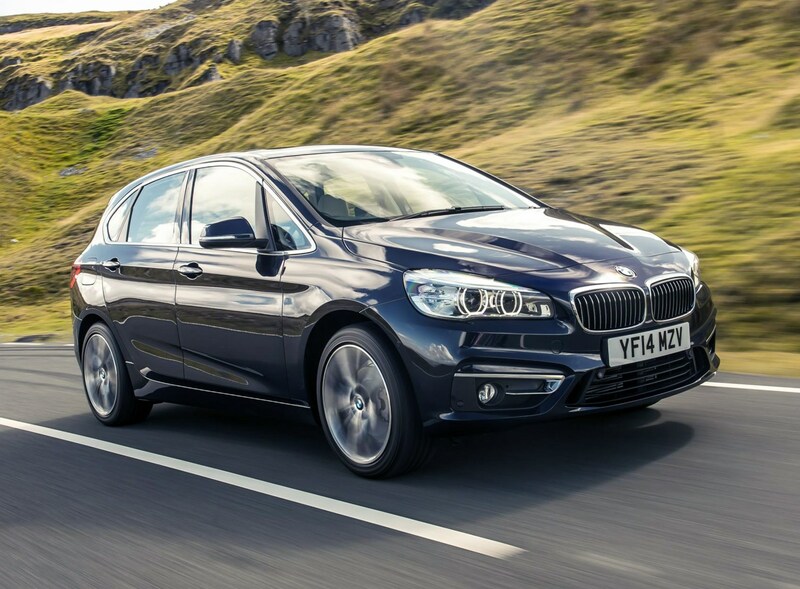 Compromise in practicality aside, the 225xe is just like the rest of the Active Tourer range. 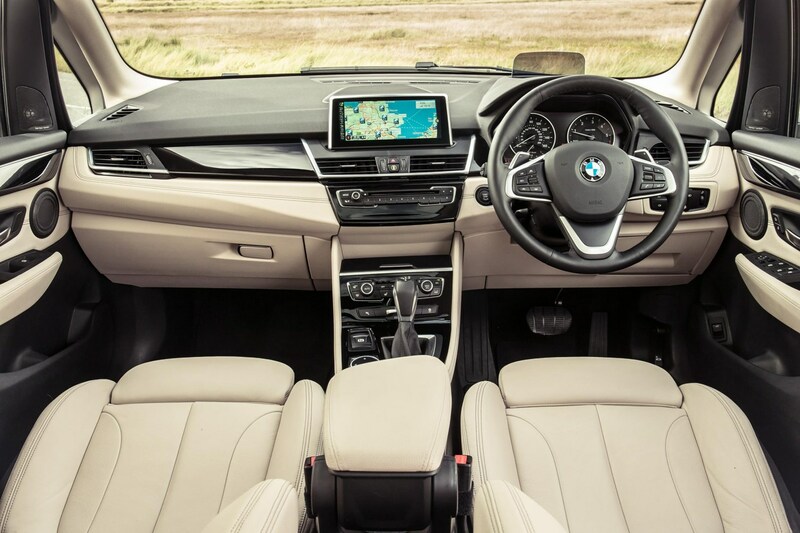 It’s incredibly easy to drive, has a high-quality, practical interior and feels suitably upmarket. 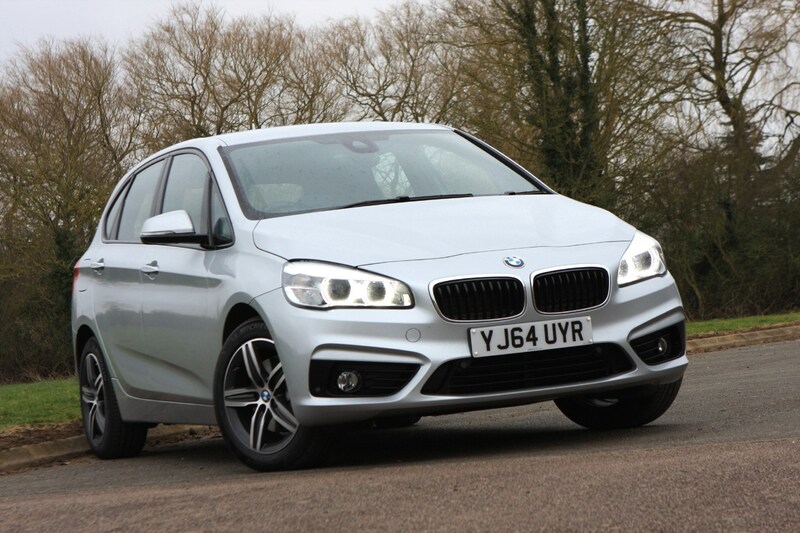 Performance is strong for a sensible family car and it’s a refined package, although the slightly firm ride might put some buyers off. 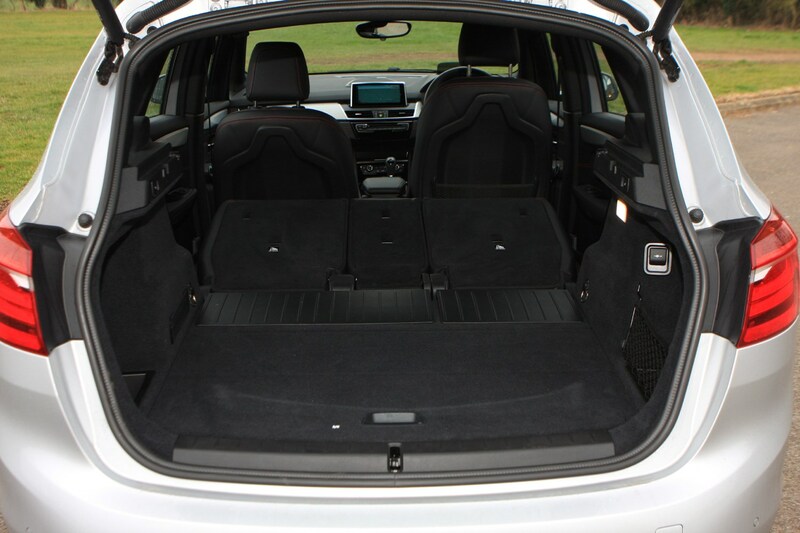 However, once you’ve scanned the options list and added some desirable optional extras, the price gets worryingly close to £40,000 which we think could be spent more wisely elsewhere on a cheap-to-run diesel estate car. 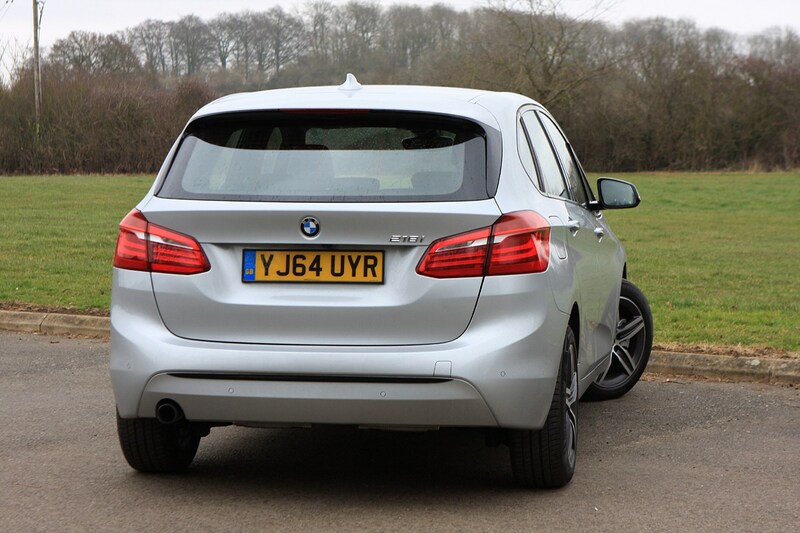 We’ve tried the entry-level petrol engine to see if a premium badge and sporty handling are enough to tempt buyers away from a SUV and into an MPV. 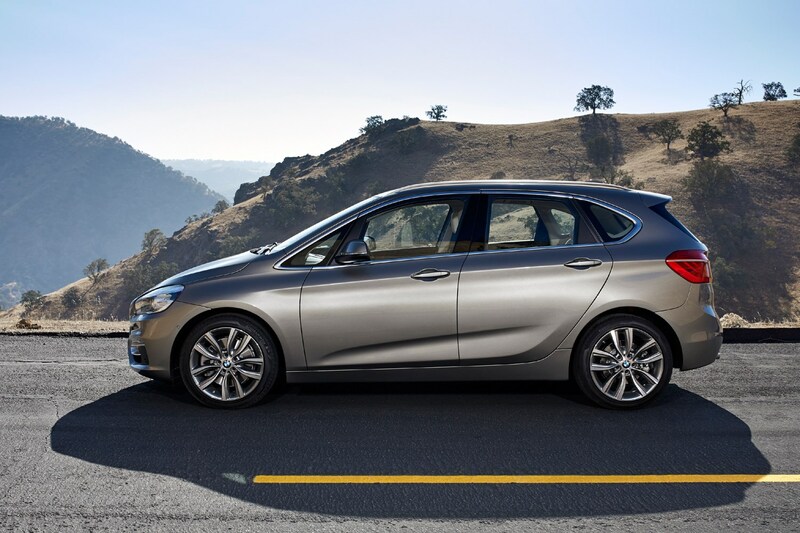 The Active Tourer will need to impress to stand up against heavyweight rivals like the Citroen C4 Picasso, Ford C-Max and Mercedes Benz B Class. 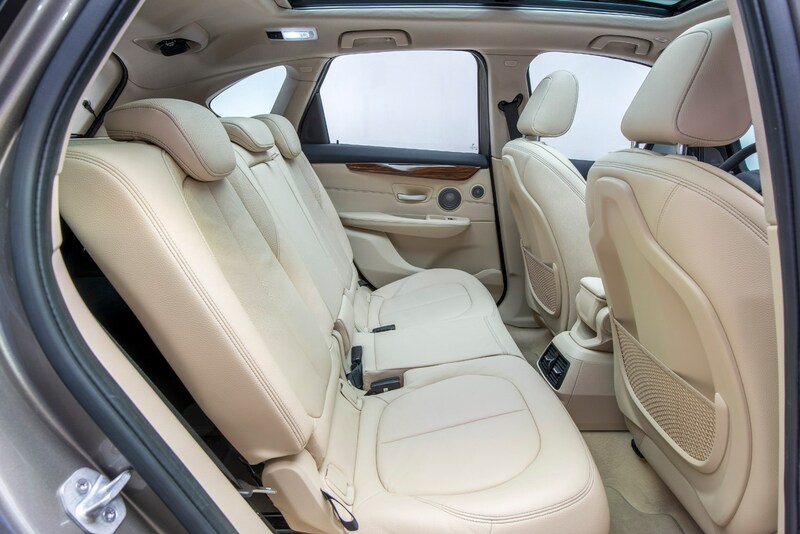 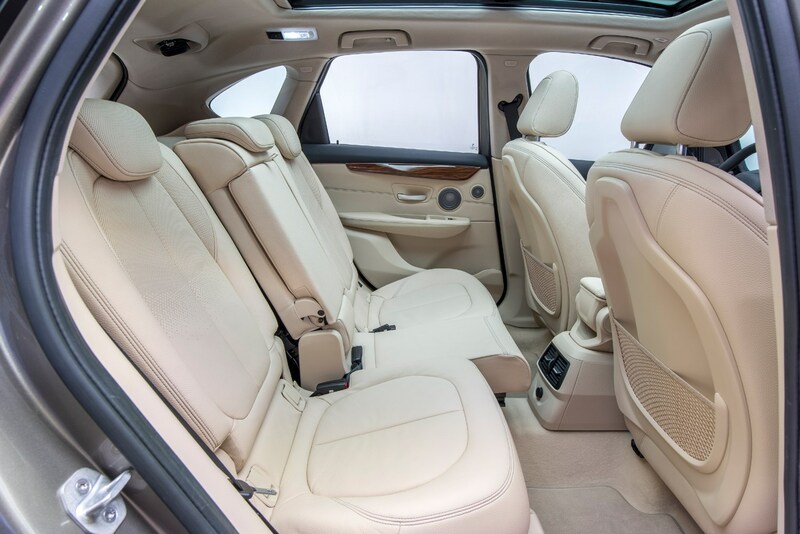 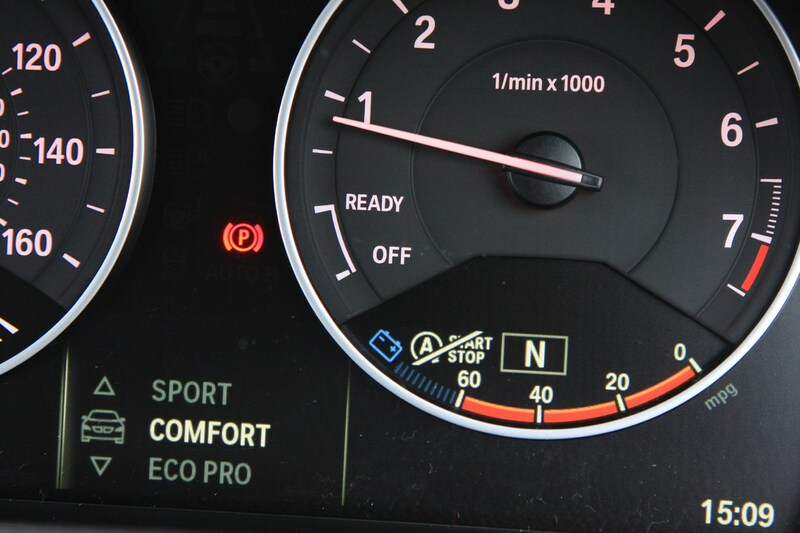 Standard comforts include dual-zone climate control, automatic headlights and wipers, rear parking sensors, and keyless start. 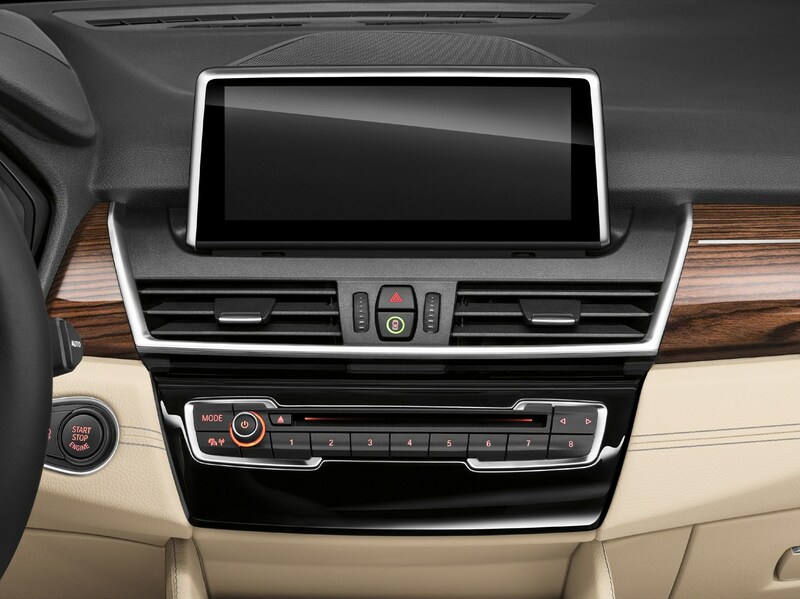 You also get DAB radio, Bluetooth and USB connectivity, and a 6.5-inch multimedia screen. 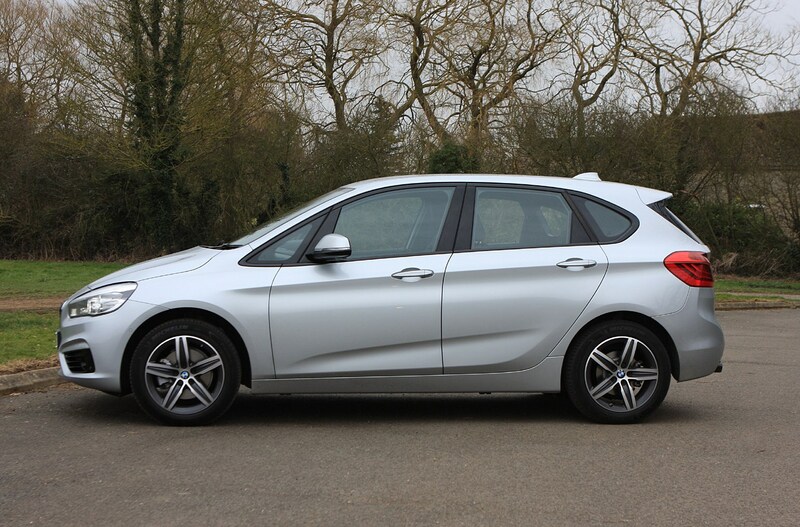 It’s safe too – with a five-star Euro NCAP rating - and a promised economy of 57mpg means low running costs, although we only saw 44mpg during our test. 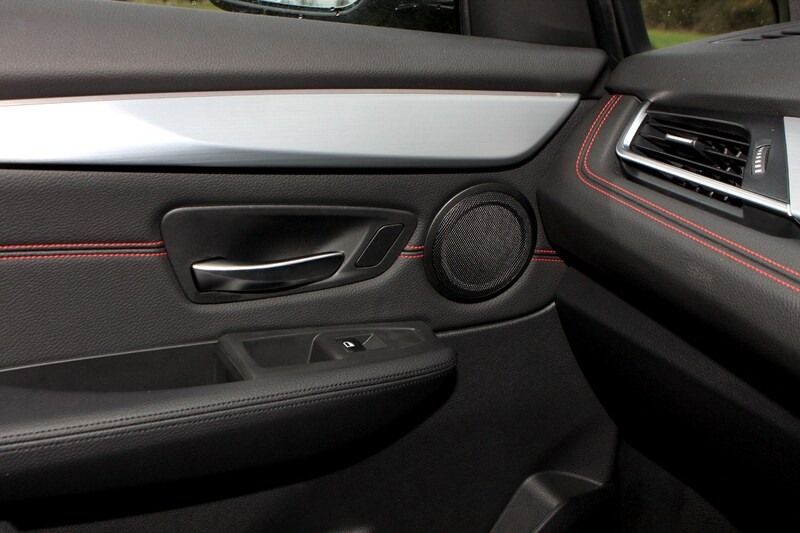 Our car comes with Glacier Silver paint (£550) and black leather upholstery with red stitching (£1,150). 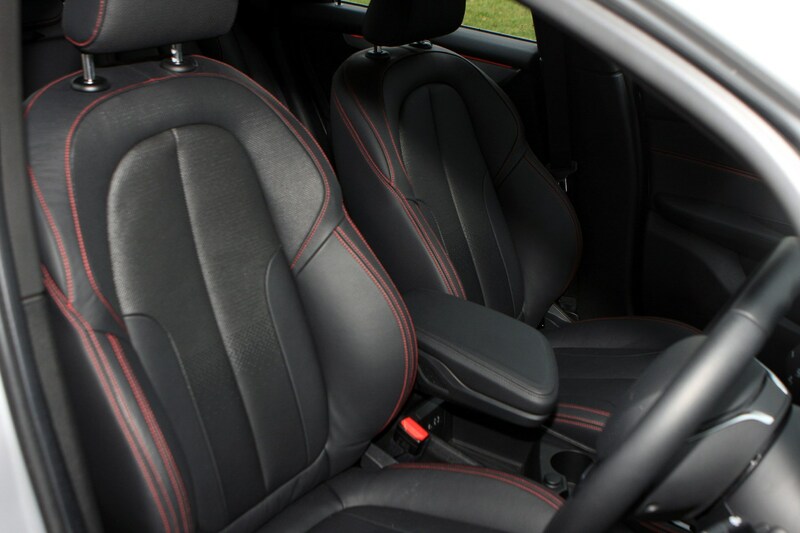 Easy to clean leather gets a thumbs-up from us, but we suspect the sartorial red stitching won’t look as nice with custard cream biscuit ground into it. 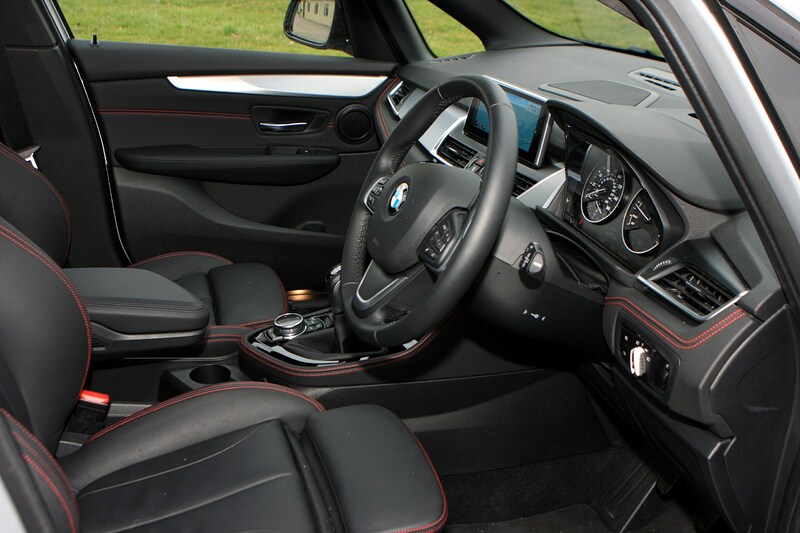 Sport trim costs an extra £1,250 and includes 17-inch alloy wheels, sports front seats, and chrome and gloss black styling. 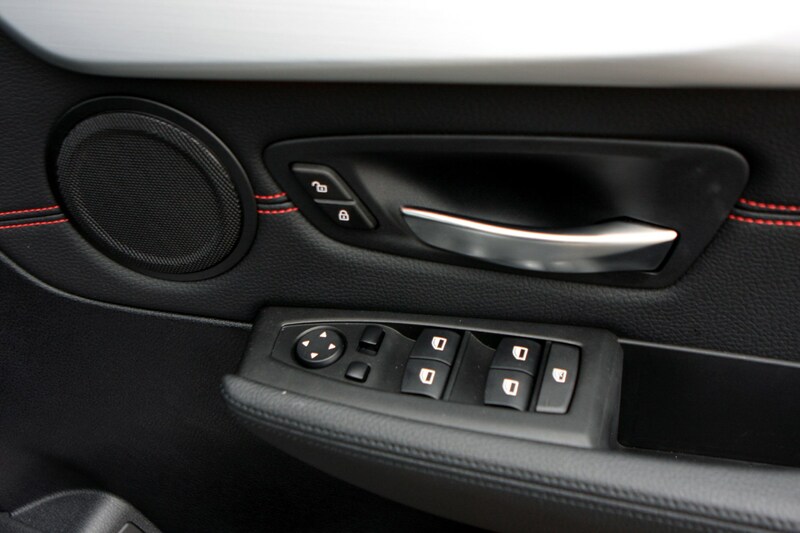 Ambient LED lighting in the doors look great and is useful for distracting younger passengers. 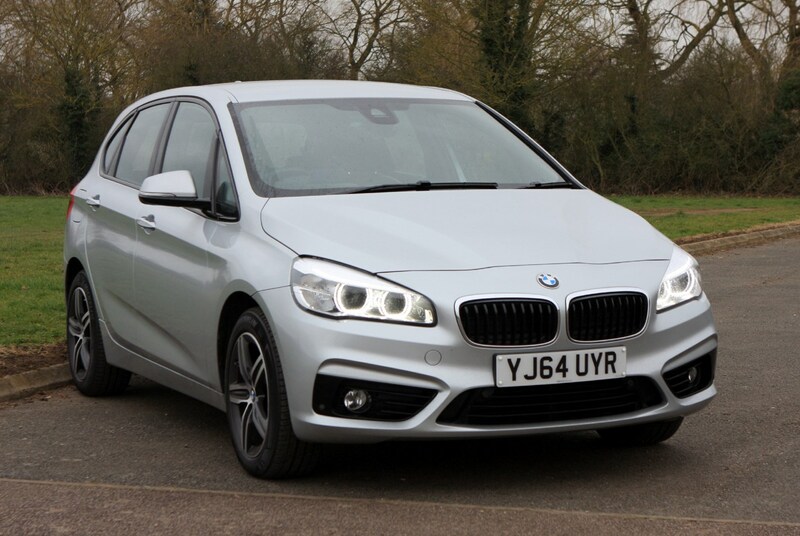 In this configuration the 218i costs £24,295, but we’ve got a further £6,810 worth of options, taking the total to £31,105. 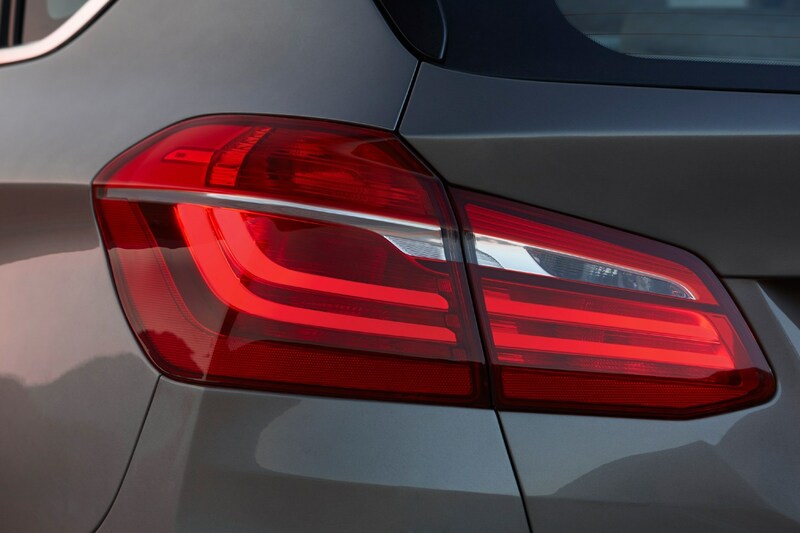 The technology package (£1,095) offers good value, with keyless entry, a reversing camera, and adaptive LED headlights, but our favourite bundle is the driver comfort package (£590). 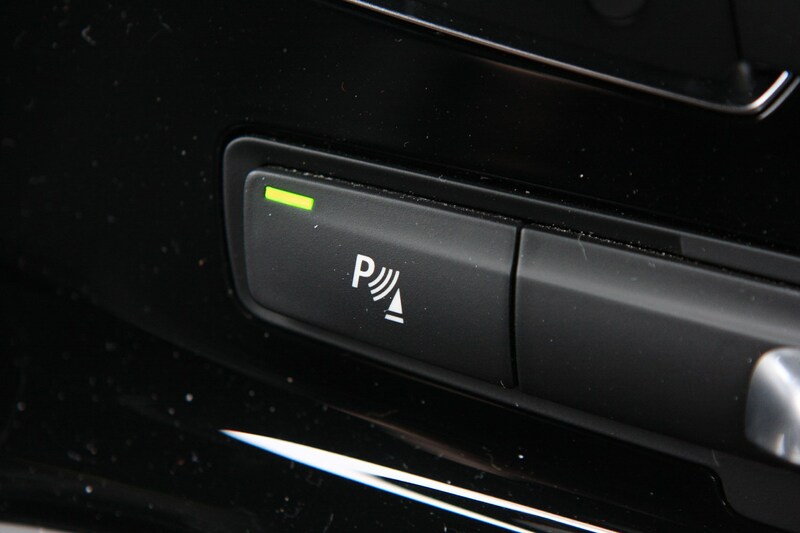 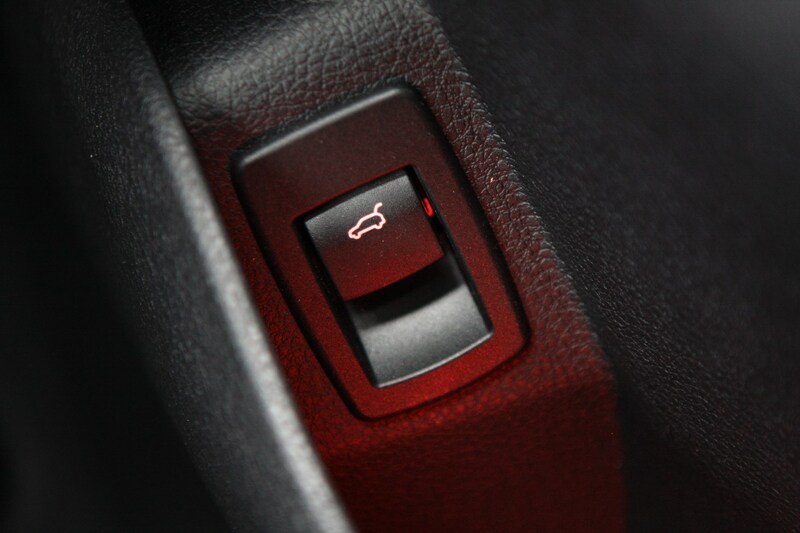 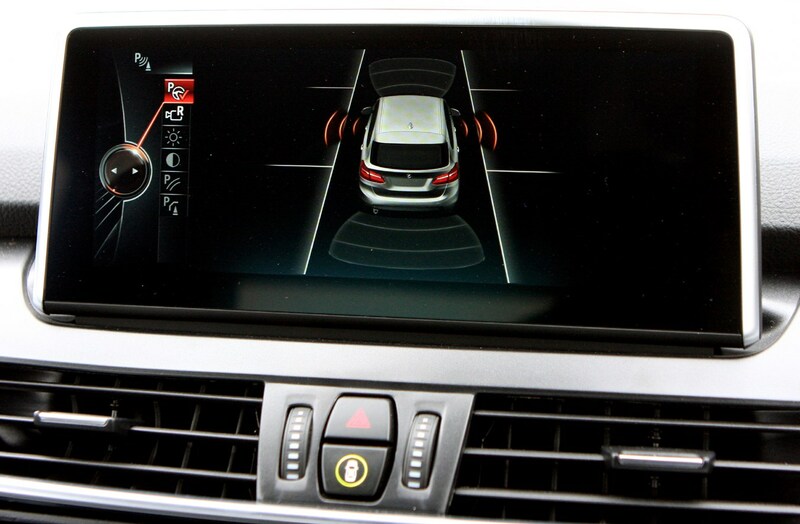 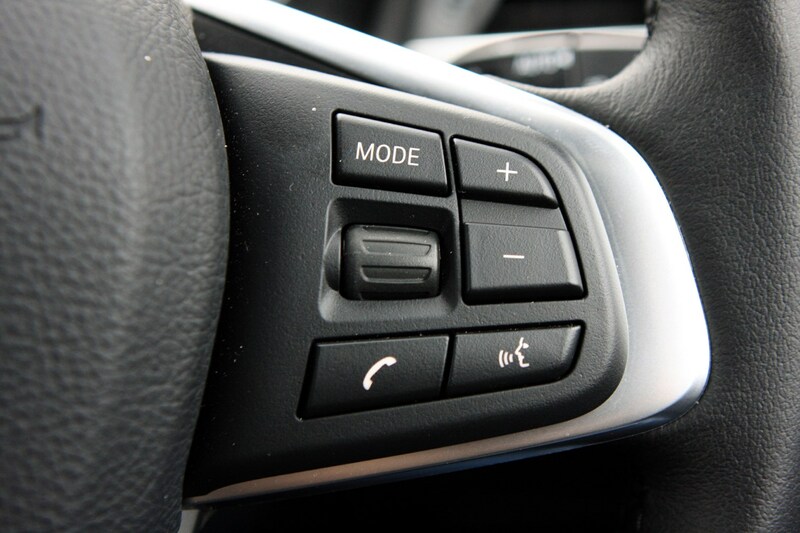 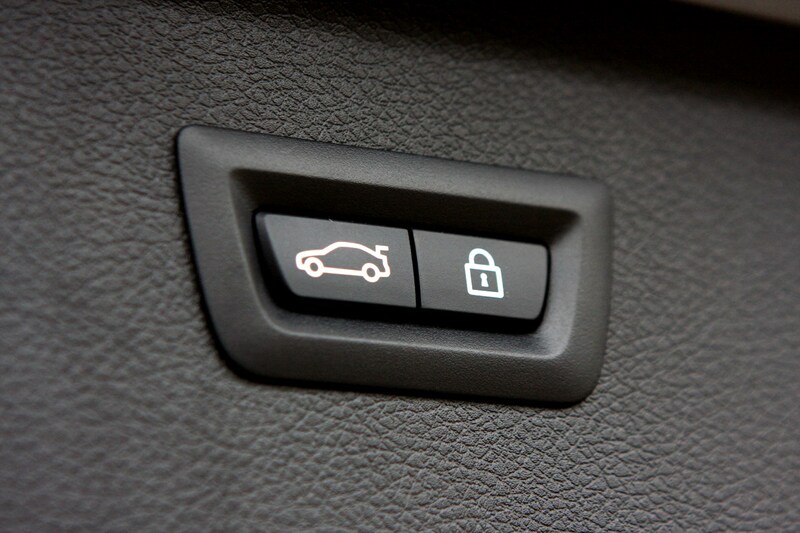 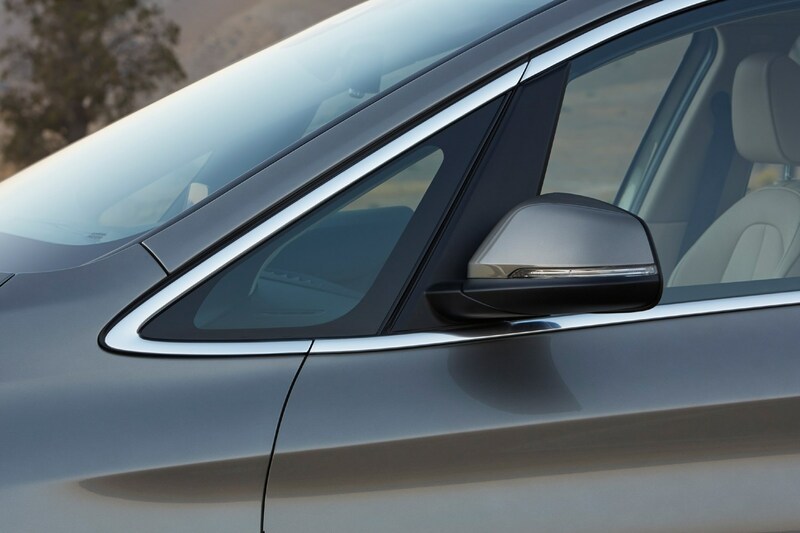 This nets you parking sensors with an on-screen graphic, cruise control, door handle lights and automatic parking. 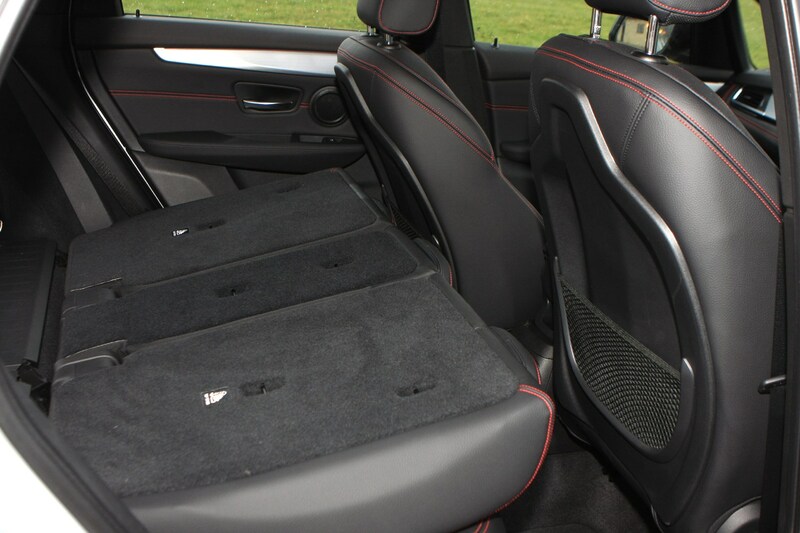 We wouldn’t bother with adjustable suspension (£390) which will spend most of its time in Comfort mode, or the slow to adjust electric seats (£650). 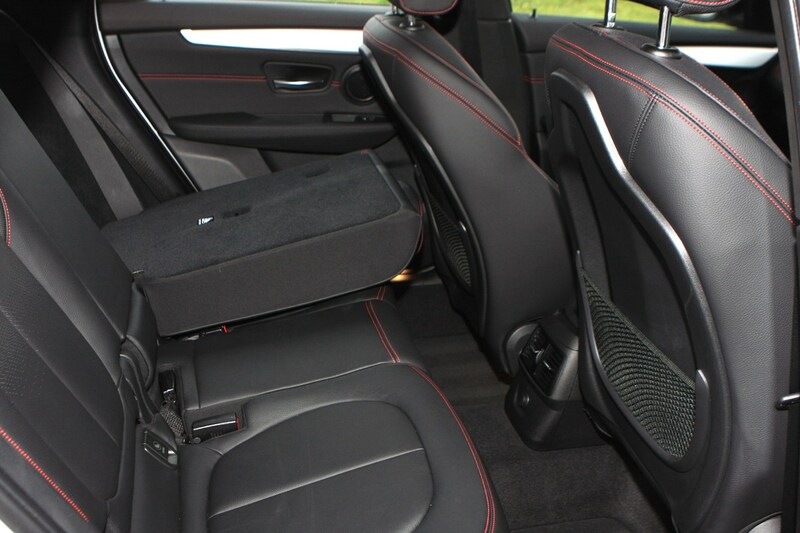 The 1.5-litre petrol engine is also used in the MINI Cooper Hatch, where its 136hp provides sprightly performance, and in this much larger car it still feels perky. 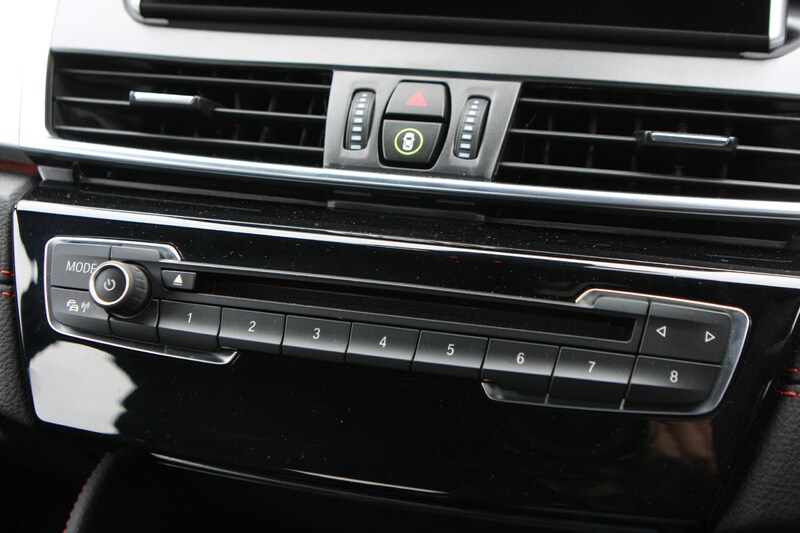 Its three cylinder thrum is hushed and there is only the faintest vibration through the pedals and gearshift at higher revs. 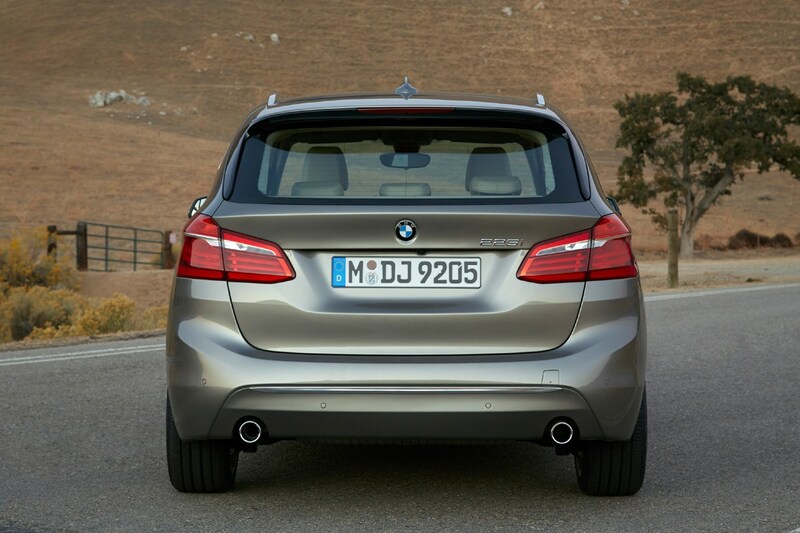 Despite turbocharging, the power delivery is linear so it’s very easy to drive in a smooth, nausea-free fashion. 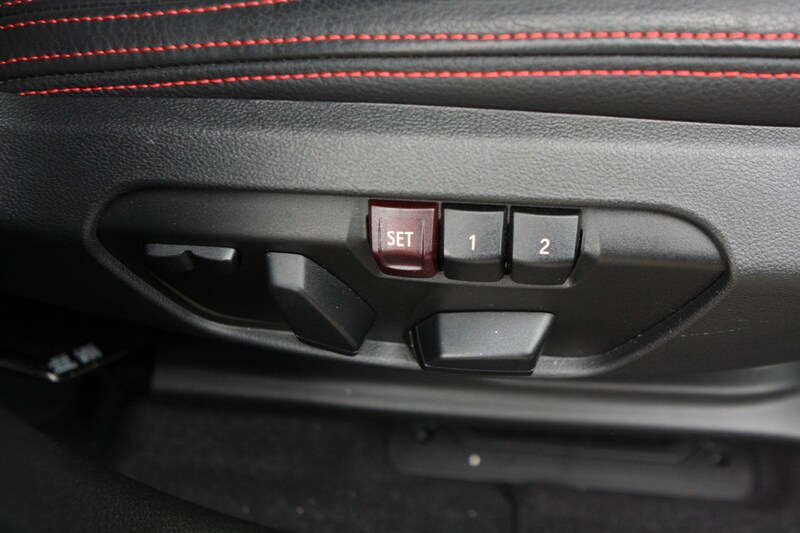 Also helping on this front is the six-speed manual gearbox which automatically blips the throttle on downshifts to enable seamless changes. 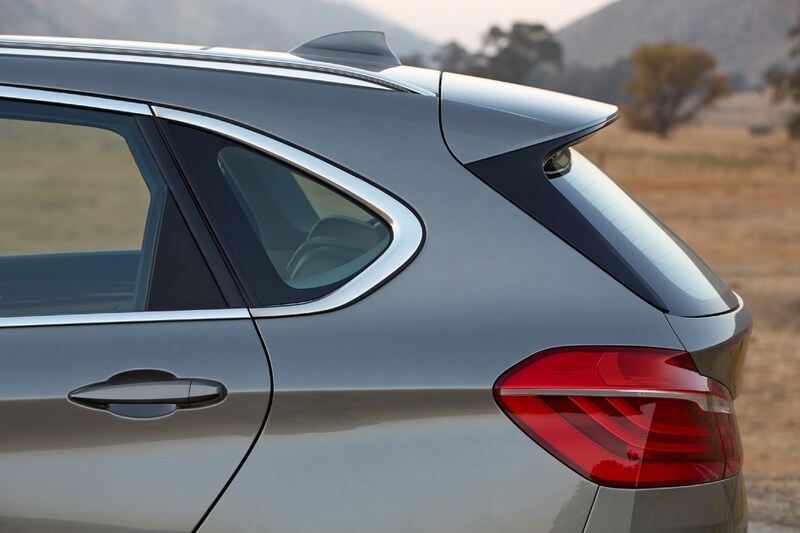 BMW markets its cars strongly on their sharp handling, so working out where to draw the line between dynamism and comfort in a tall-sided, front wheel drive family wagon was always going to be difficult. 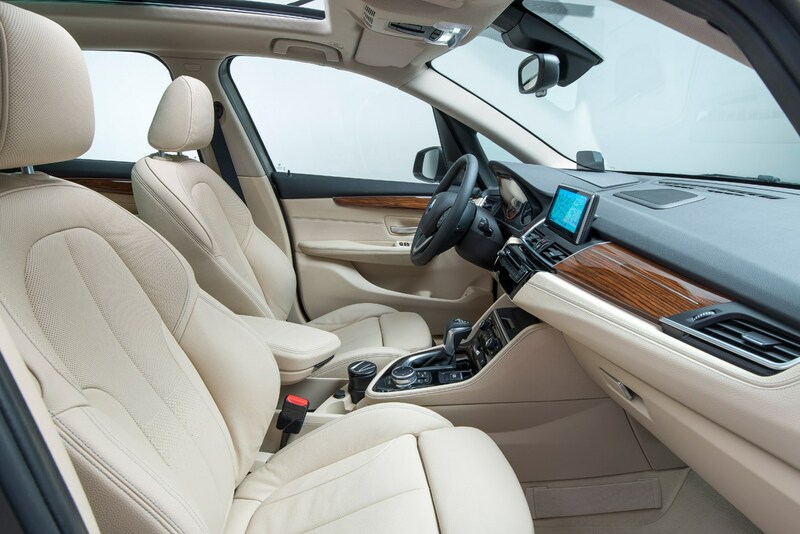 The ride is firm at low speed but does soften up while cruising, and this comes with the advantage of keeping sea-sick inducing body roll to a minimum. 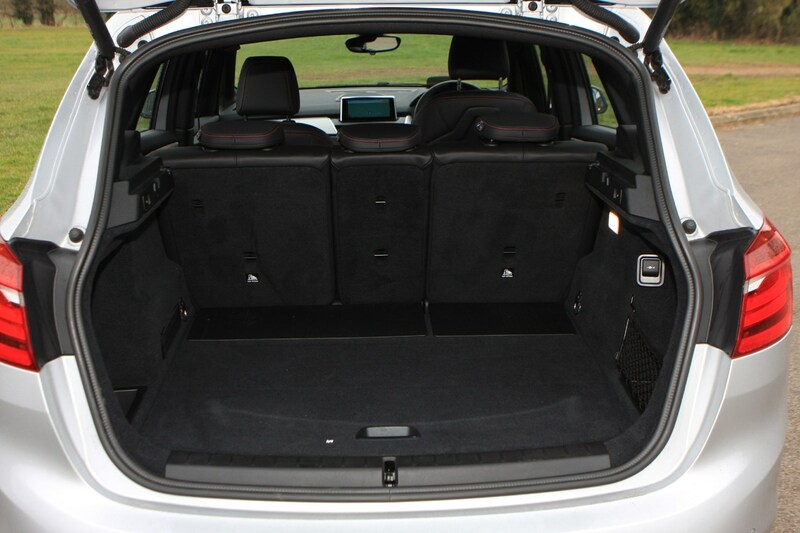 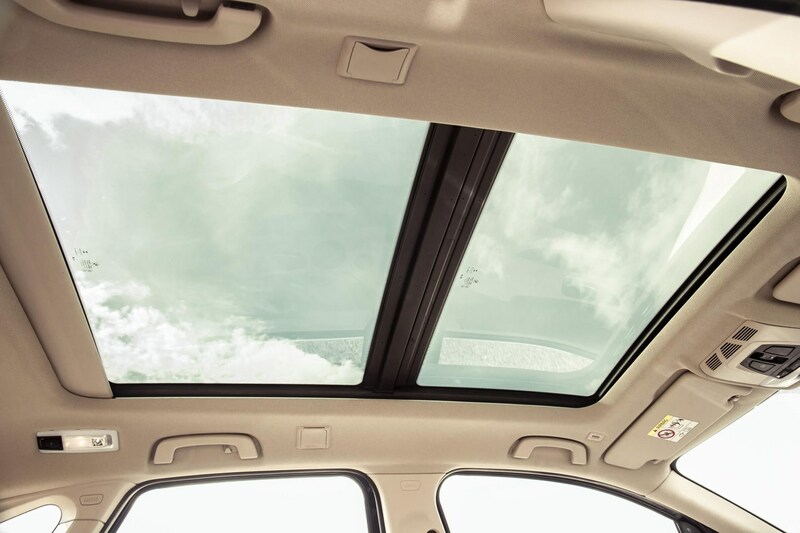 The Active Tourer does a good job of combining the interior space of an estate with the manoeuvrability and ease of use of a small car. 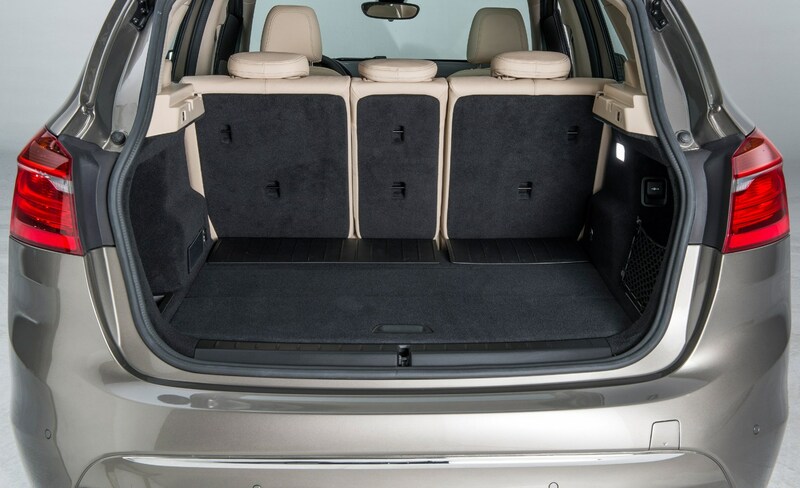 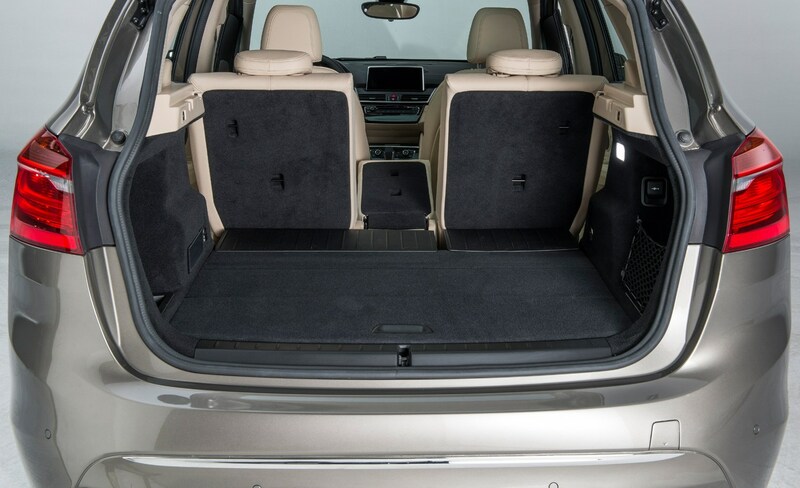 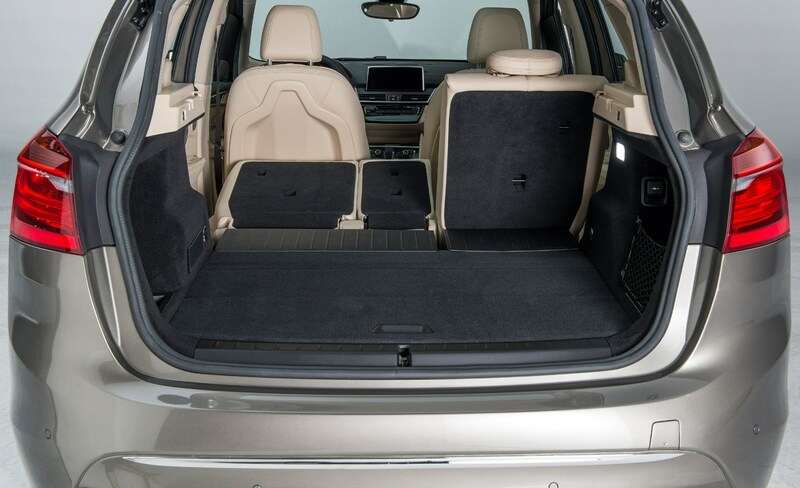 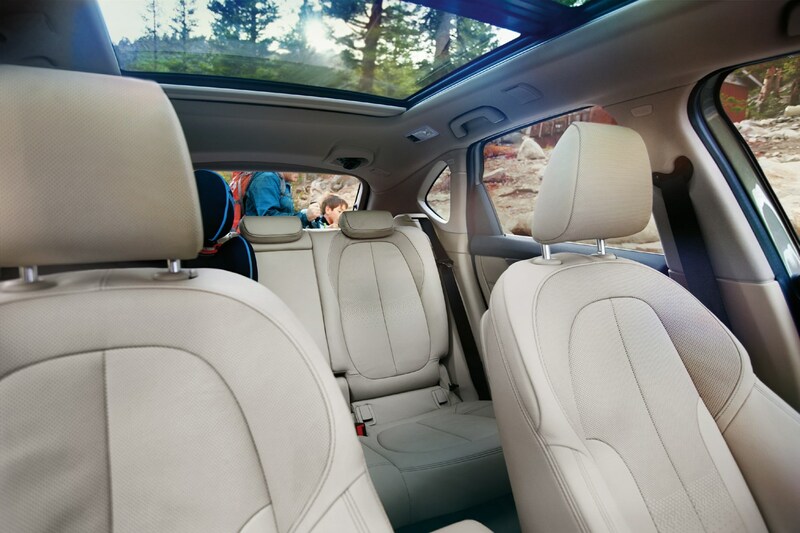 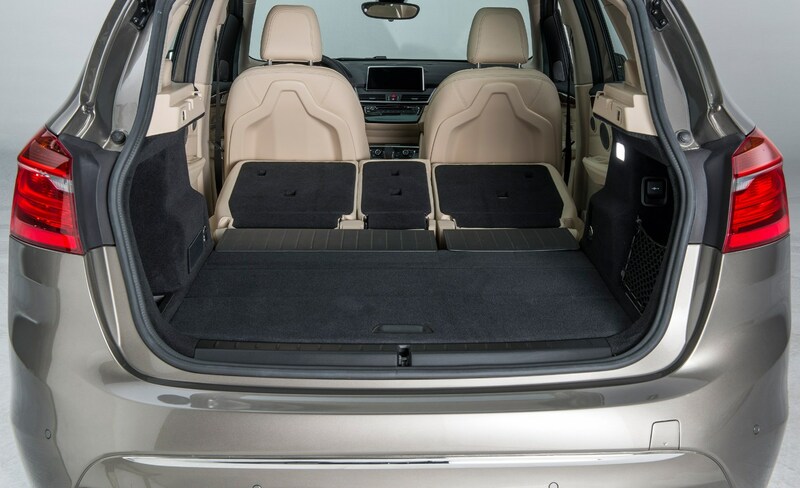 If you want a big boot, space for the family, and that all important badge, then it’s an easy choice. 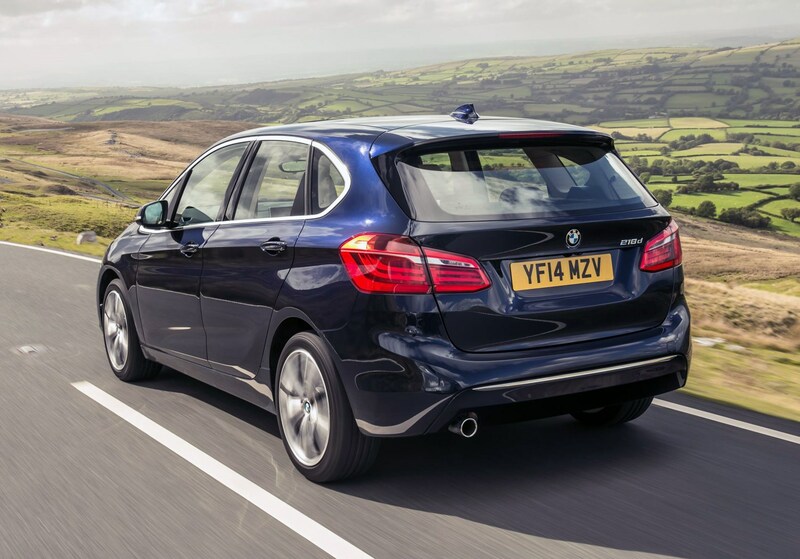 Just be careful when it comes to the options list, as our car's final cost (£31,105) could be spent on larger and arguably more practical 3 Series Touring in Sport trim, with a more powerful diesel or petrol engine instead. 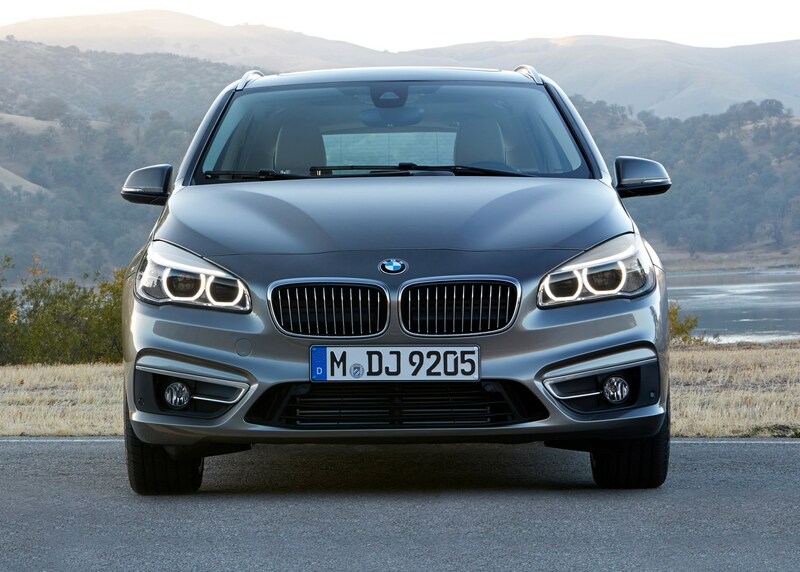 Here’s the 218d – an engine which boasts lower CO2 output than the more powerful 220d we’re expecting to be most popular with private buyers. 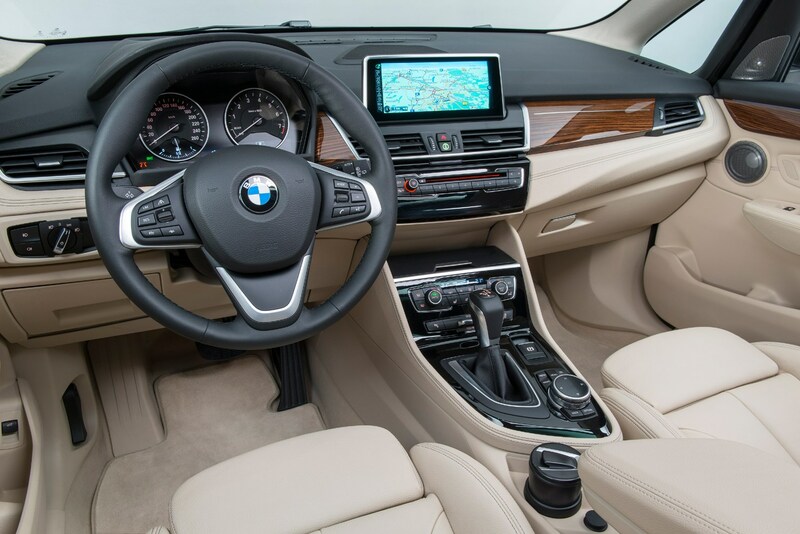 While just 3g/km might seem a trivial difference (the 218d emits 109g/km, the equivalent 220d emitting 112g/km) that means a lot for company car drivers. 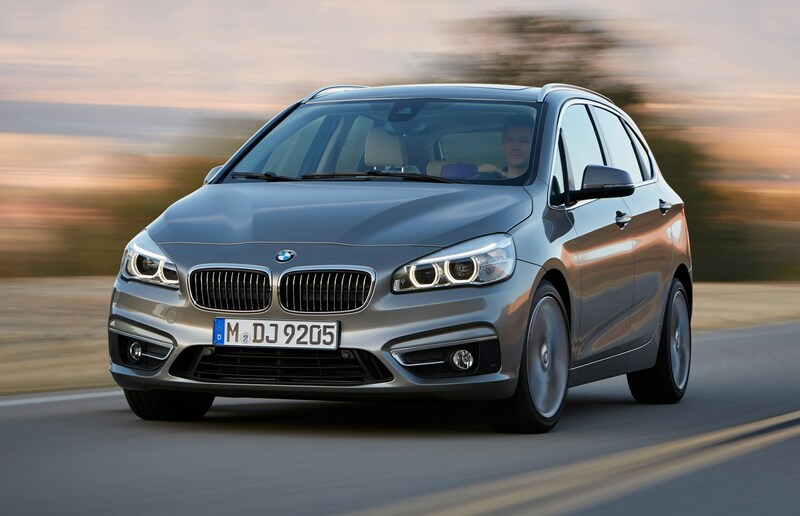 The performance penalty is 40hp, which equates to 0-62mph in 8.9 seconds rather than 7.5 seconds for the 220d. 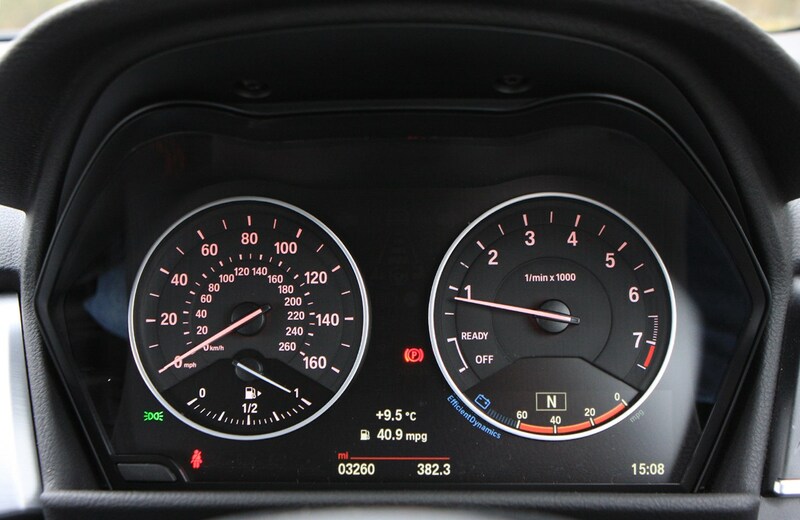 It genuinely doesn’t feel slow, though. 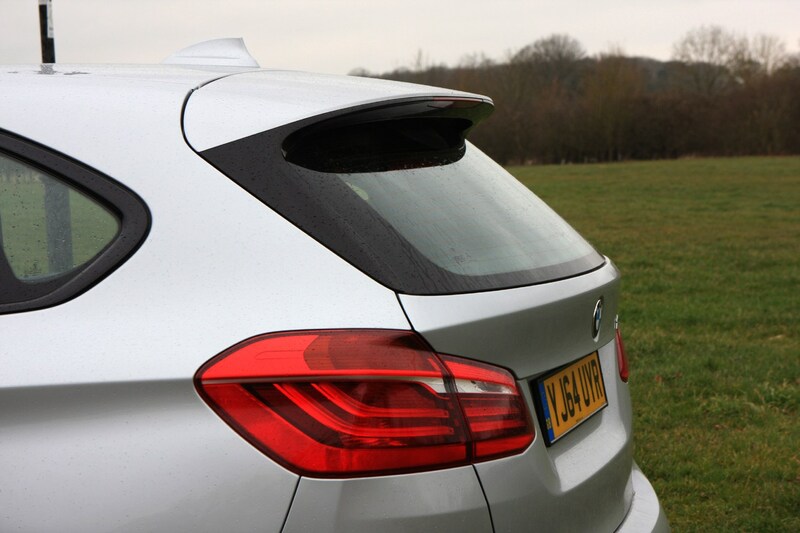 There’s a healthy 330Nm of torque on offer here, which means the Active Tourer is still capable of getting on with it when required. 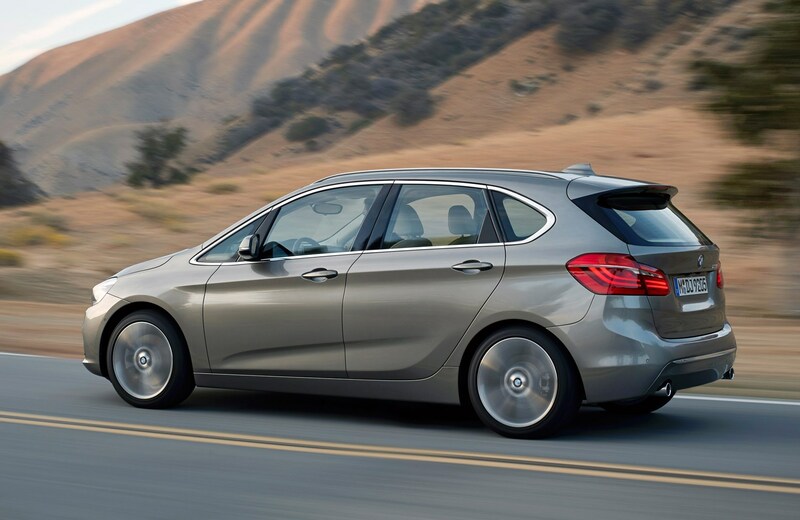 This car drives like a BMW, which is something many were worried about when this – the first front-wheel drive car from the firm – was announced. 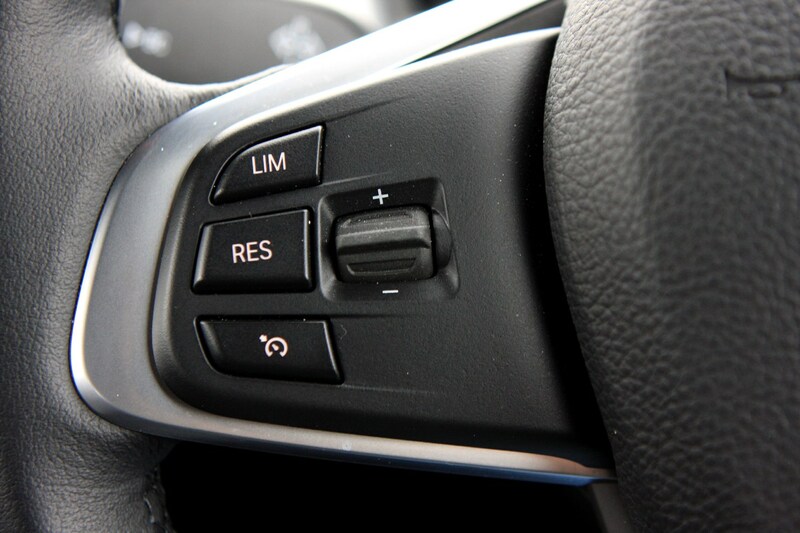 It’s the same for the handling, too. 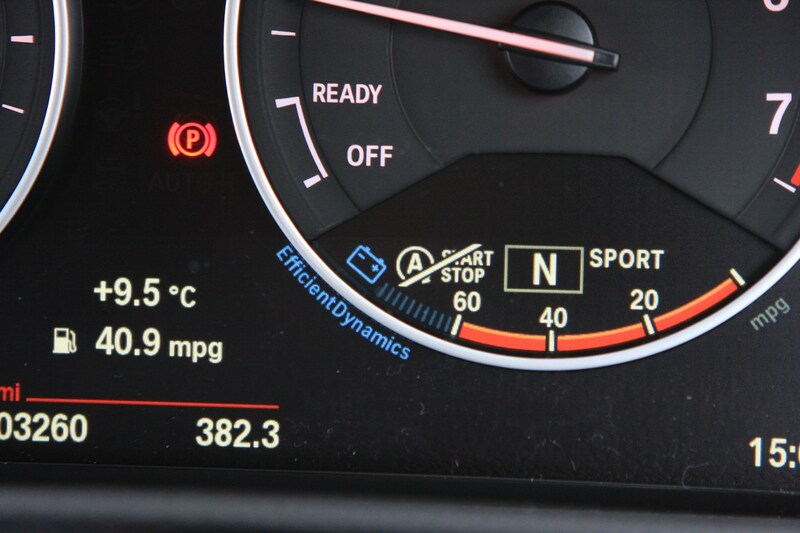 Claimed fuel economy is 68.9mpg, but we found close to 55mpg was more realistic when we were driving. 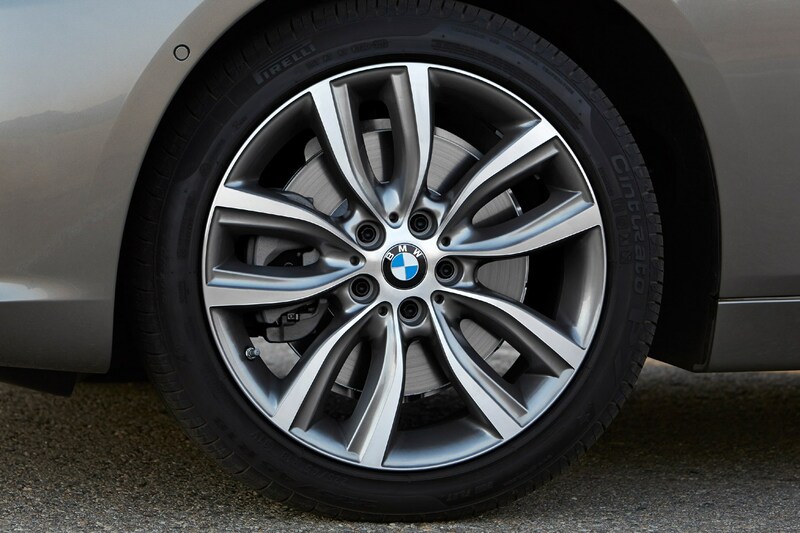 It’s worth noting that our car had 17-inch alloys though; cars with 18s will suffer slightly worse fuel economy if everything else remains constant. 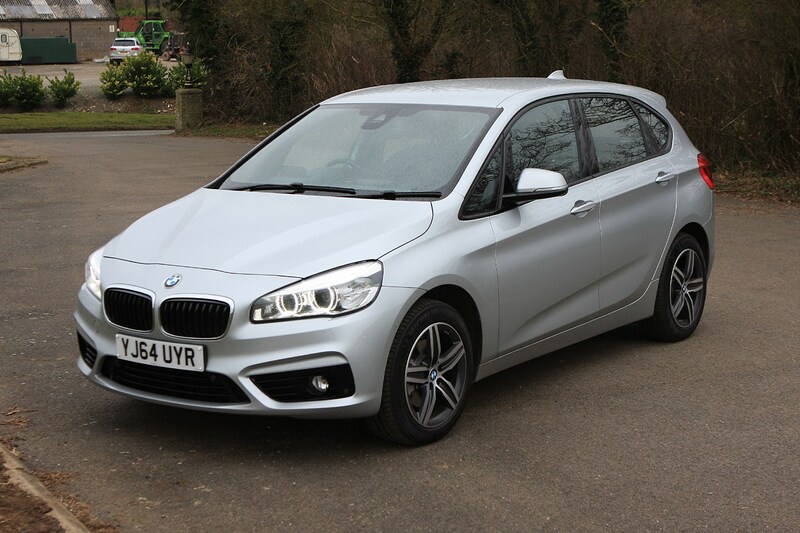 Our car came with the optional £1,685 sports automatic gearbox in place of a six-speed manual, and we’re happy to report it’s excellent: it shifts smoothly and you’re never caught between gears, which can be a problem on some rival attempts. 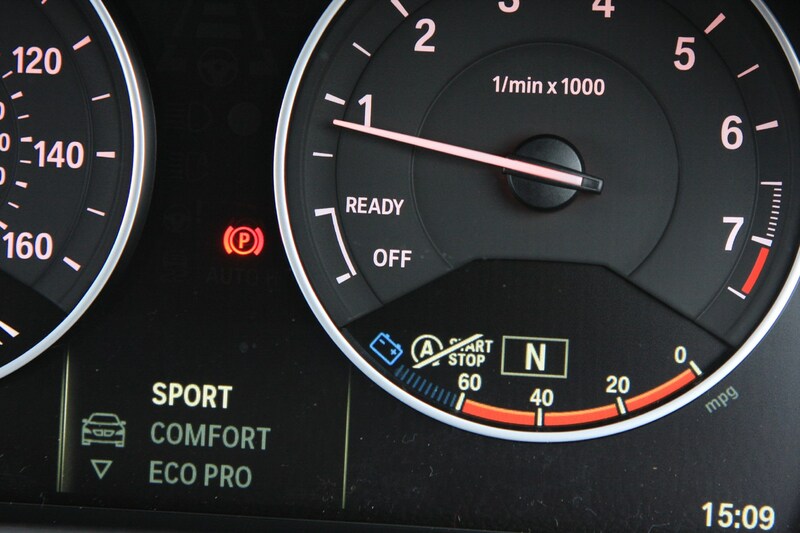 The other advantage is that many models in the range are actually fractionally quicker as automatics than as manuals. 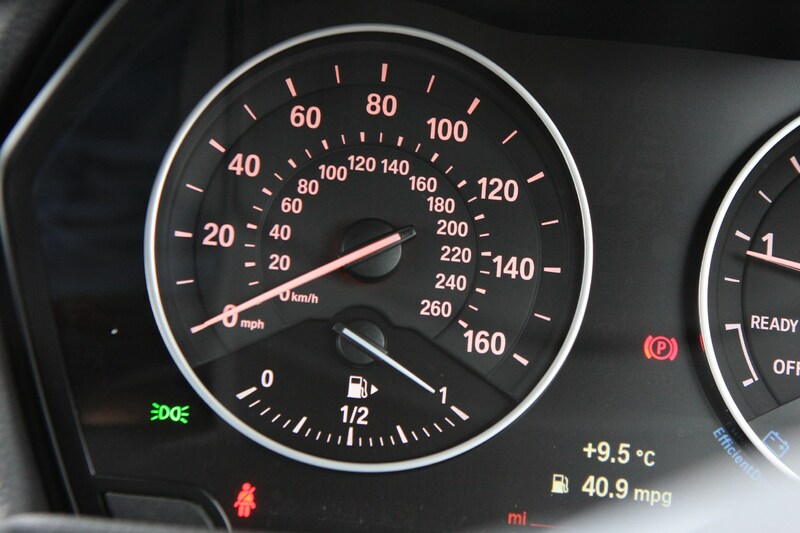 We’re talking tenths of seconds here, but every little helps. 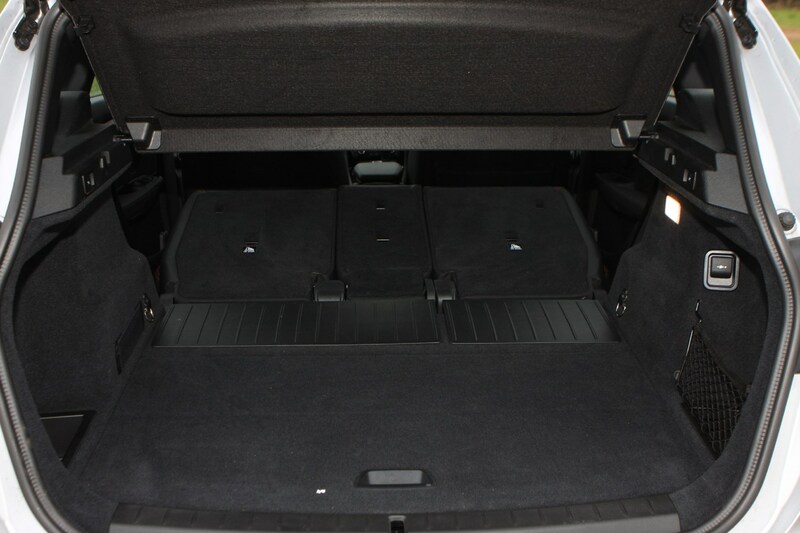 While we’re on the subject of optional extras, there’s a total of £8,560 piled on top of this car’s list price in add-ons alone. 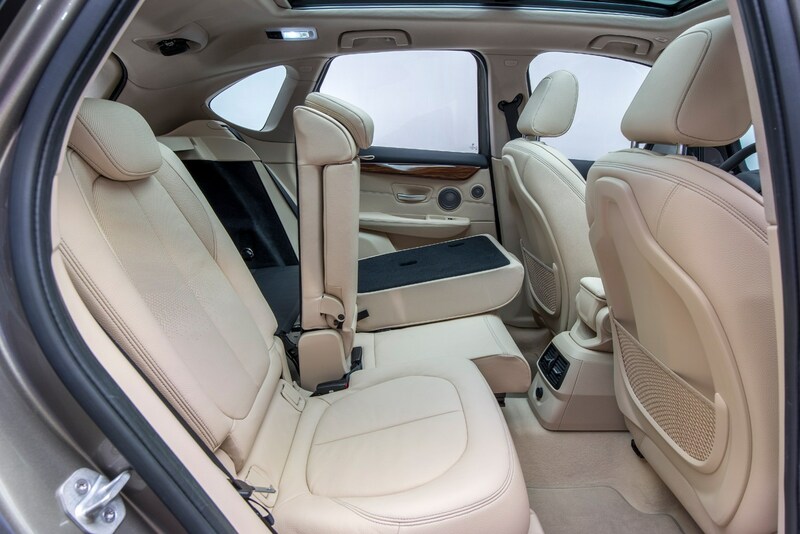 It’s in Luxury specification before all that, which means you get leather upholstery along with an automatic powered tailgate, air-conditioning, parking sensors, DAB radio, Bluetooth and USB connectivity and Drive Performance Control, which allows the driver to tweak the car’s driving characteristics for either eco, sporty or comfortable driving. 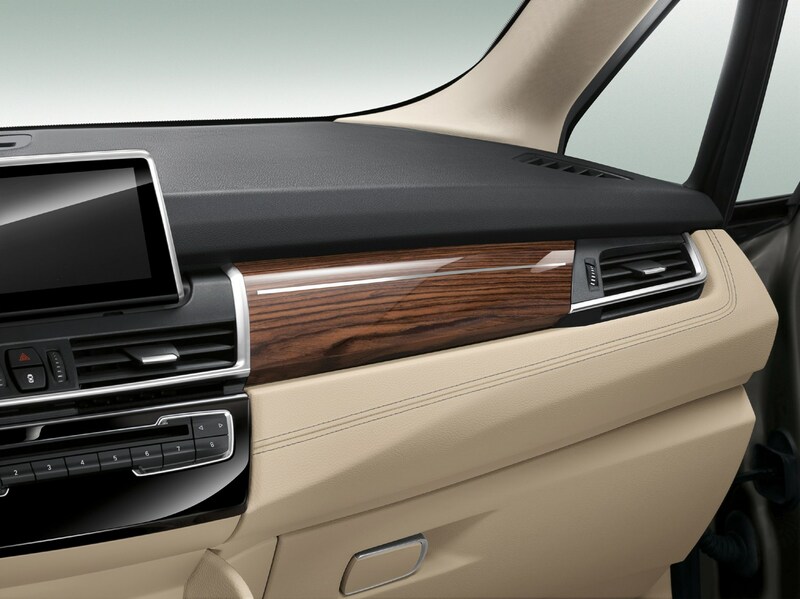 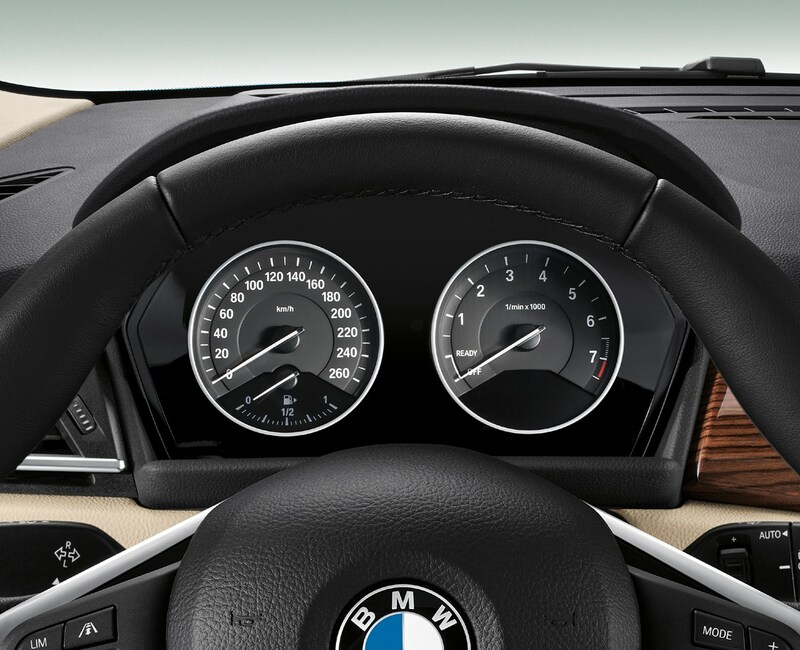 The most expensive extra we’ve got installed is the BMW Navigation Plus Package. 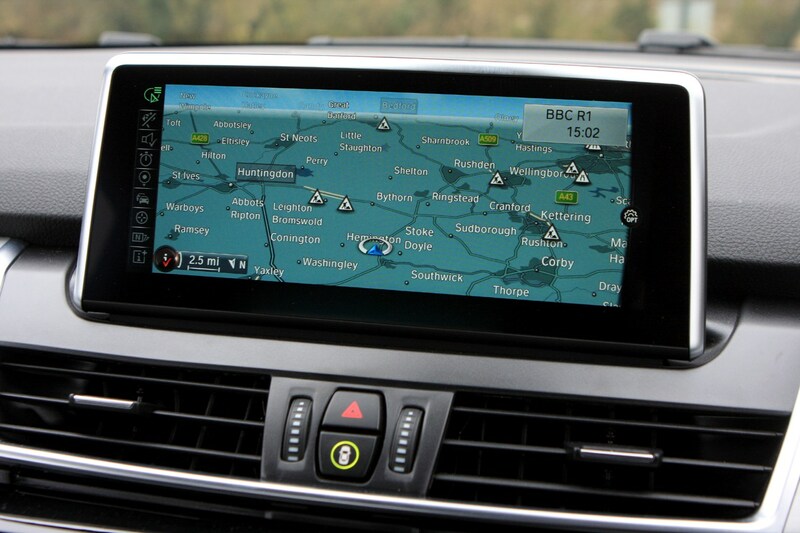 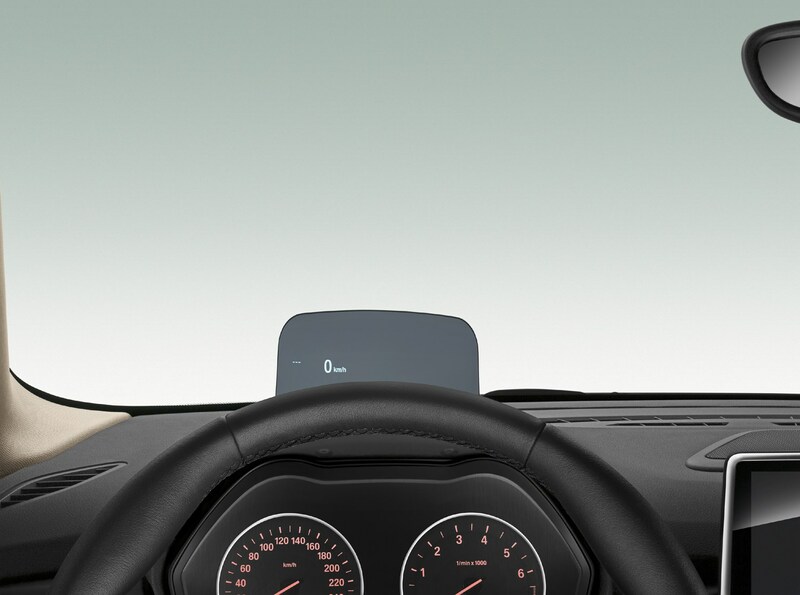 This includes sat-nav along with real-time traffic information and an internet connection to enable BMW’s Online Services. 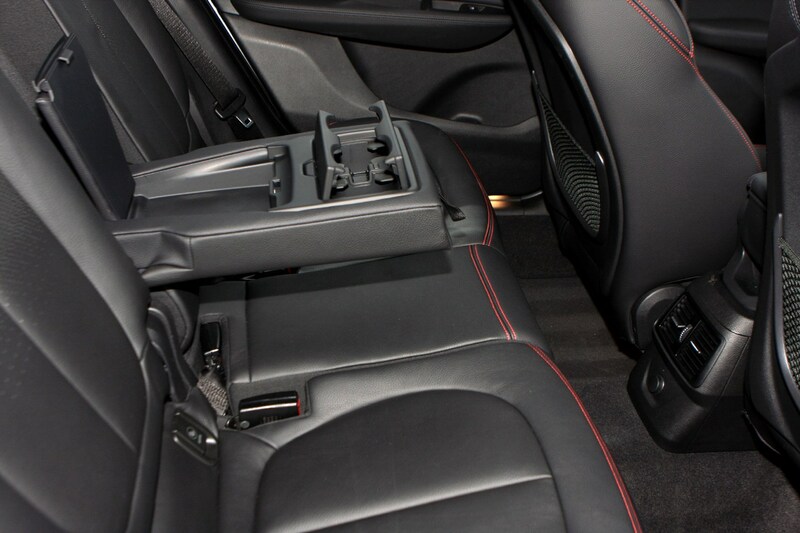 This little lot costs £2,095. 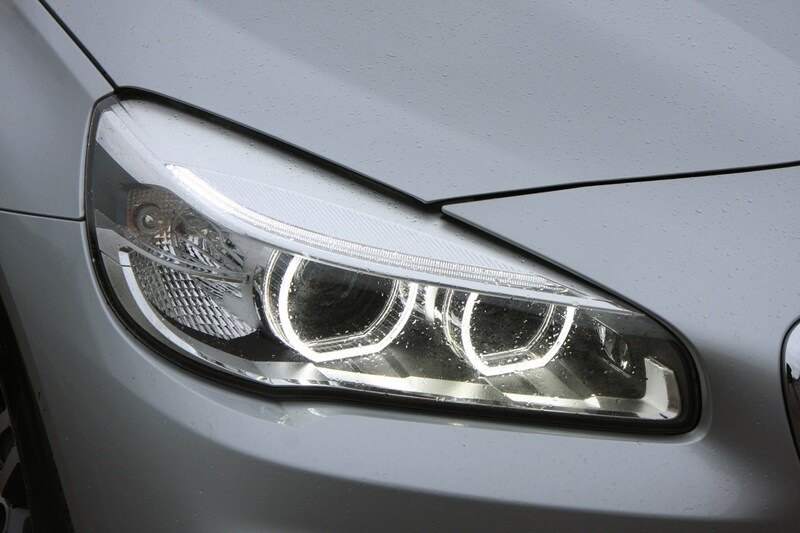 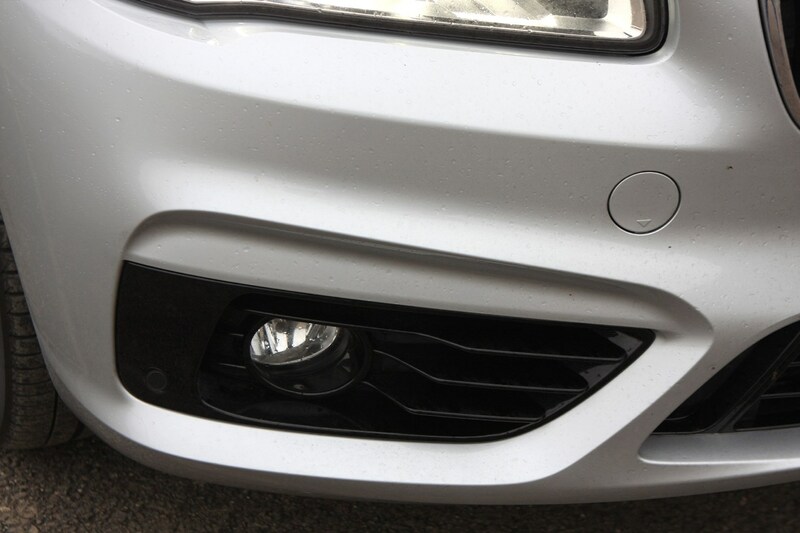 For a further £1,095 the Technology Package includes a reversing camera, keyless entry and adaptive LED headlights. 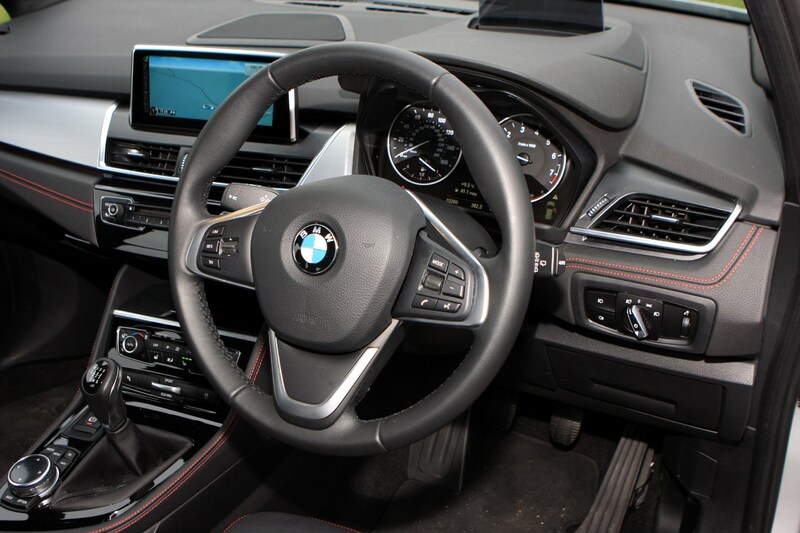 We also had the Driver Assist Package installed, its £590 price tag buying you adaptive cruise control and an automatic parking system as well as an extended interior lighting package. 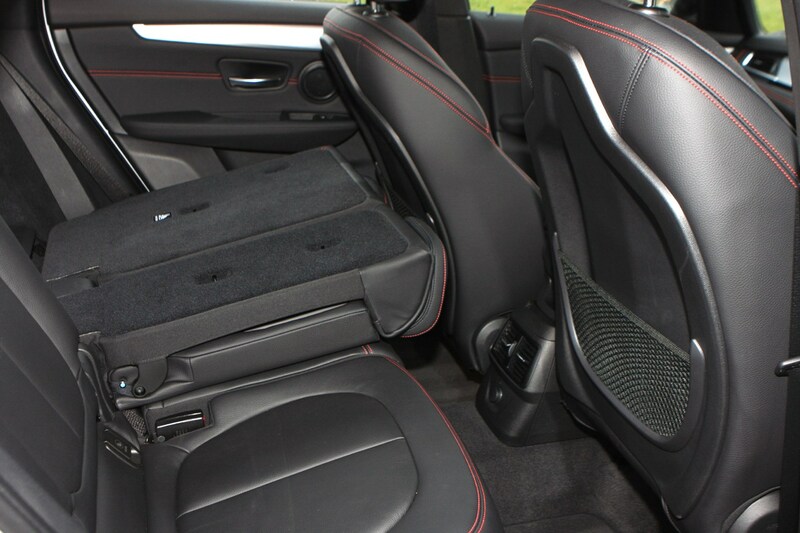 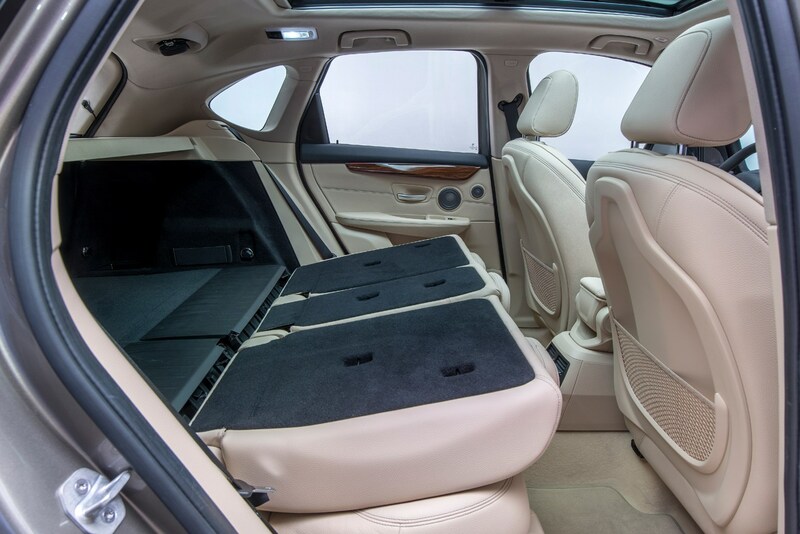 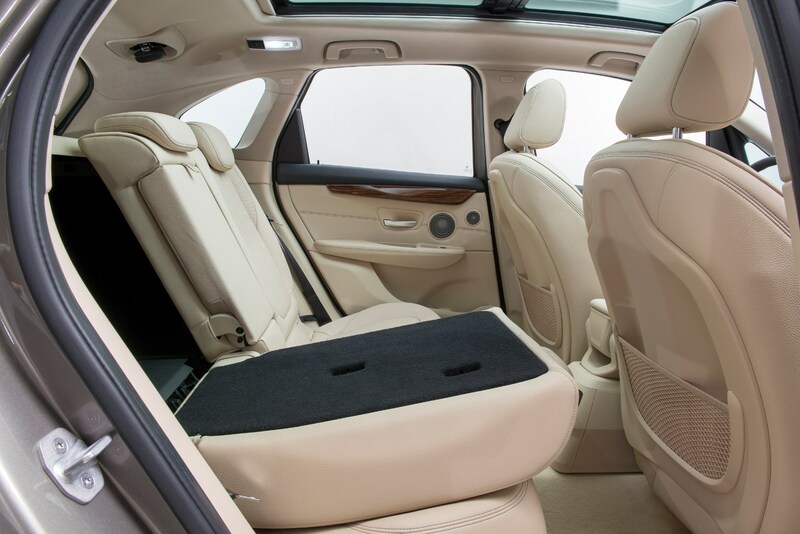 Selecting sports seats will set you back £395 and having the front seats heated will cost you £295 – both of these seem very expensive to us, though. 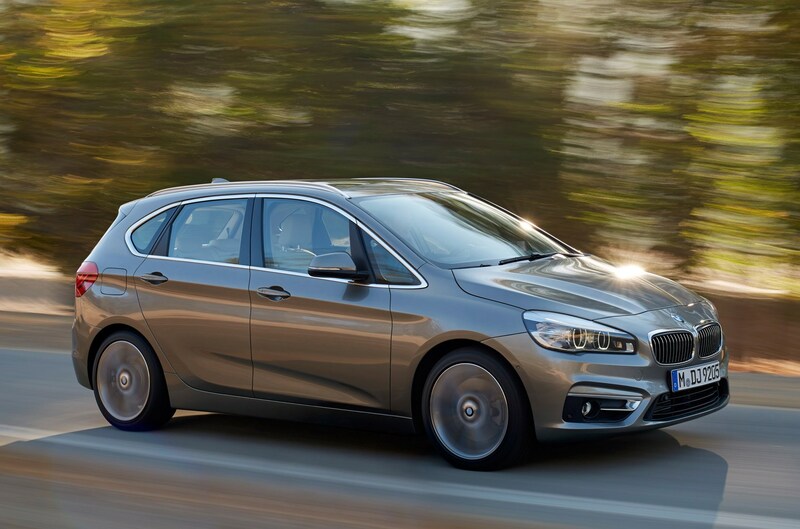 The 218d seems to be the ideal version of the Active Tourer for company car drivers until the forthcoming 216d version appears. 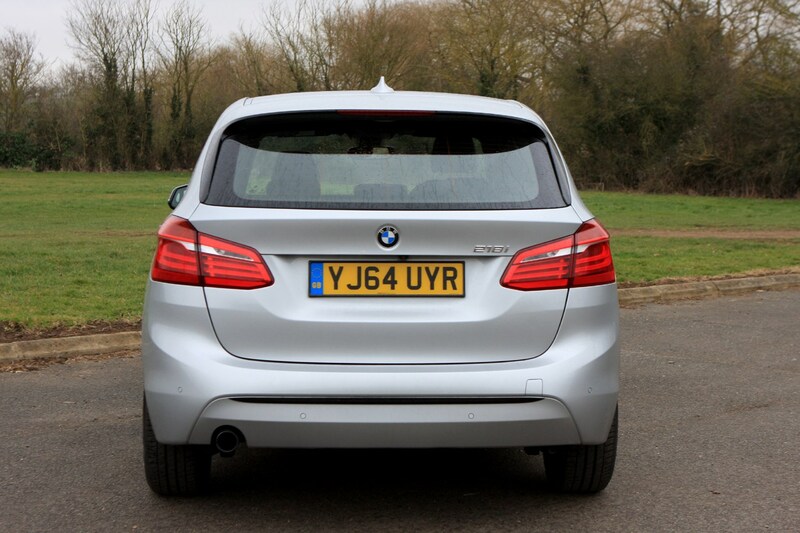 It doesn’t emit much CO2 and still drives like a BMW should, so there isn’t a lot to complain about. 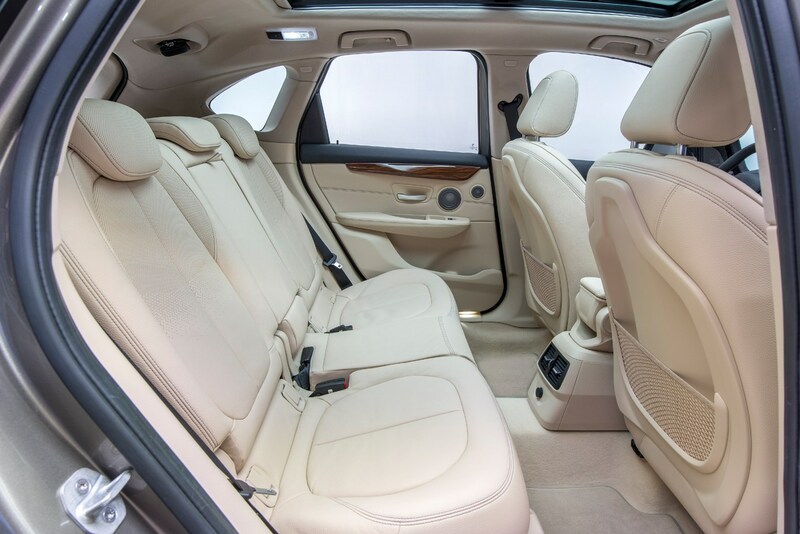 We’re not sure we’d plump for Luxury specification though – it seems a little extravagant considering the kit you get on SE-spec models, which come in at £2,000 cheaper to buy. 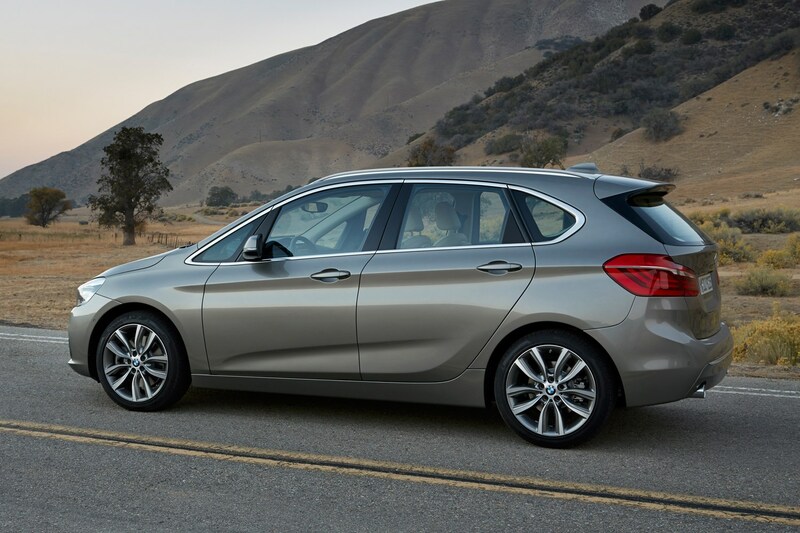 We’d spend the difference on some choice options just as the Technology Package or the Driver Assist Package. 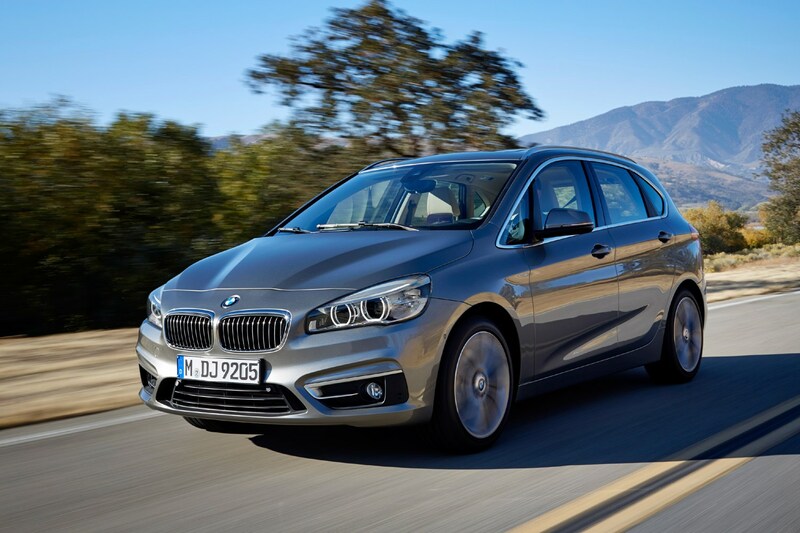 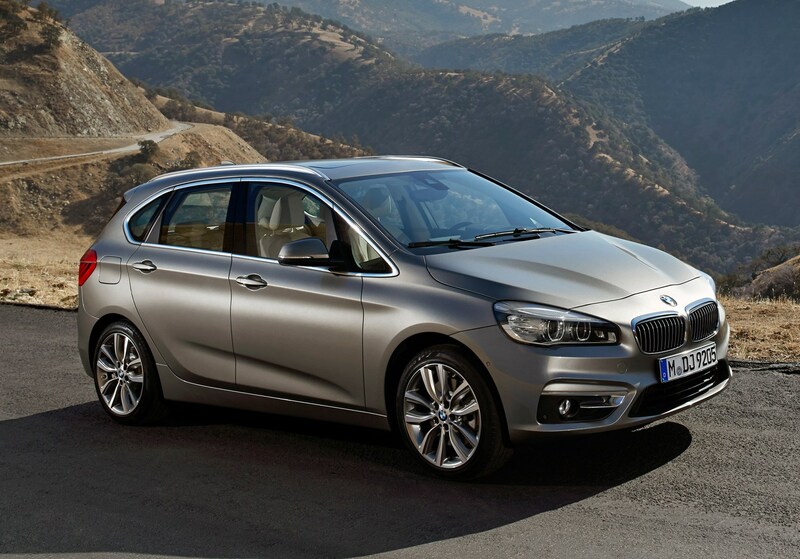 September 2014 – New 2 Series Active Tourer goes on sale with 218i and 218d engines. 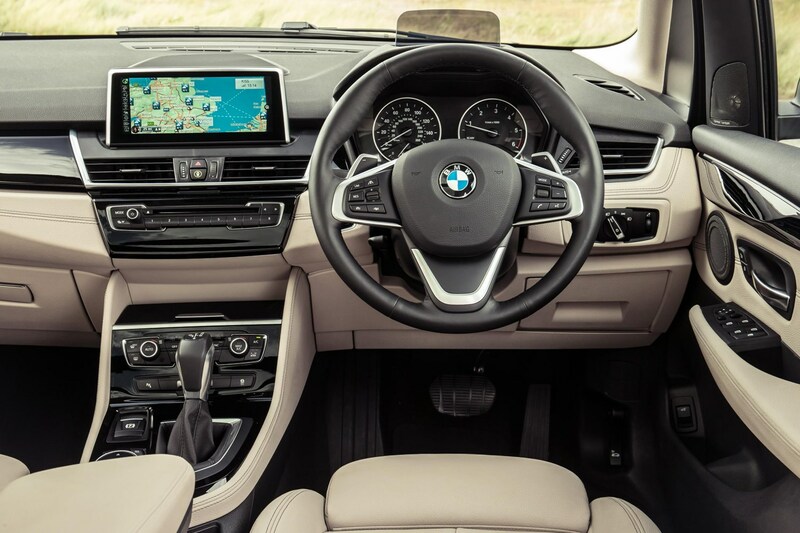 SE, Sport, Luxury and M Sport specifications available, with all cars getting powered tailgate, parking sensors, BMW Professional multimedia, automatic lights and wipers, and Comfort and Sport drive modes. 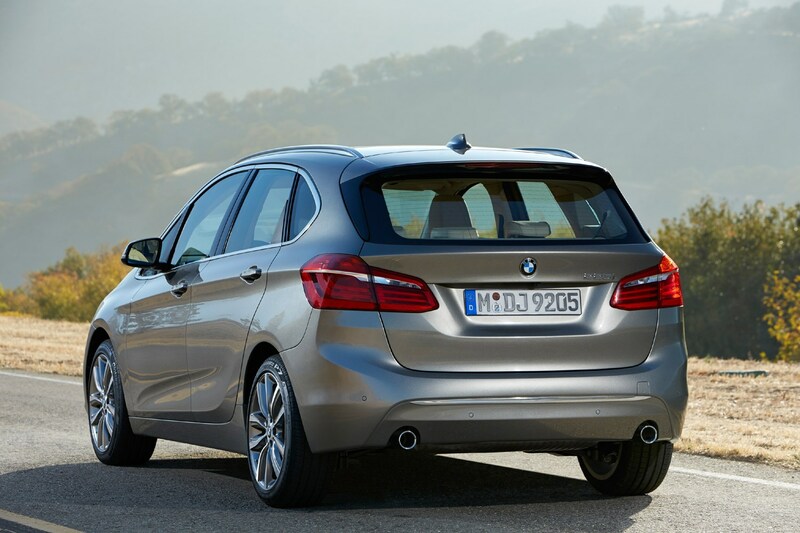 November 2014 – BMW launches higher-powered 225i with xDrive all-wheel drive, alongside 220i, 216d, 220d and 220d xDrive models. 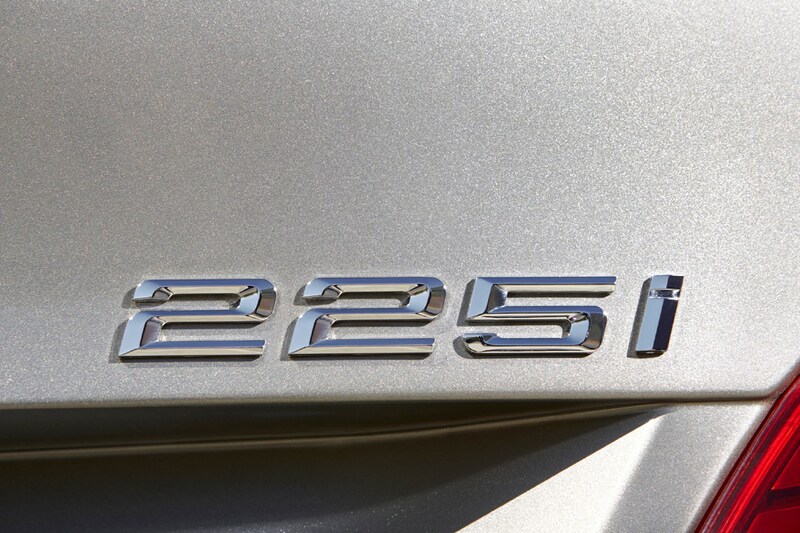 July 2016 – Plug-in hybrid 225xe becomes available, claiming 46g/km CO2 output and fuel economy above 140mpg. 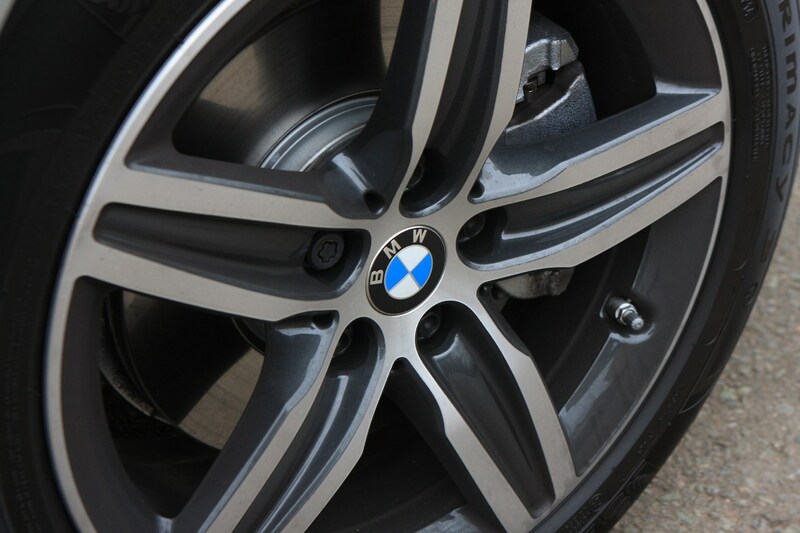 Uses hybrid tech from i8 sports car and as a result has all-wheel drive. 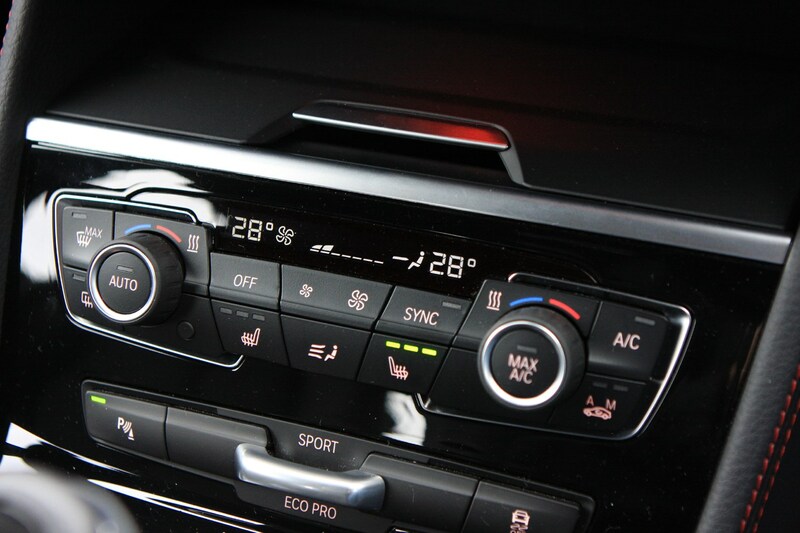 July 2017 – 225i models discontinued. 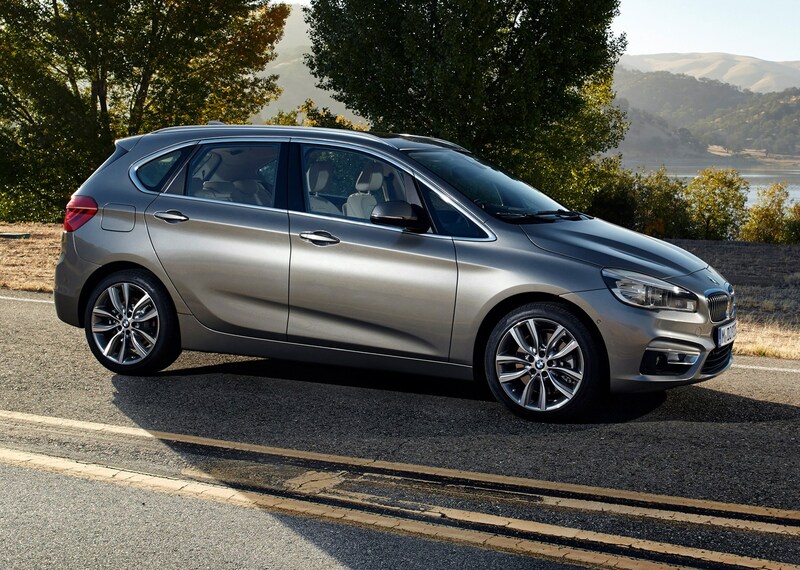 February 2018 – Mid-life facelift for Active Tourer available to order for May delivery. 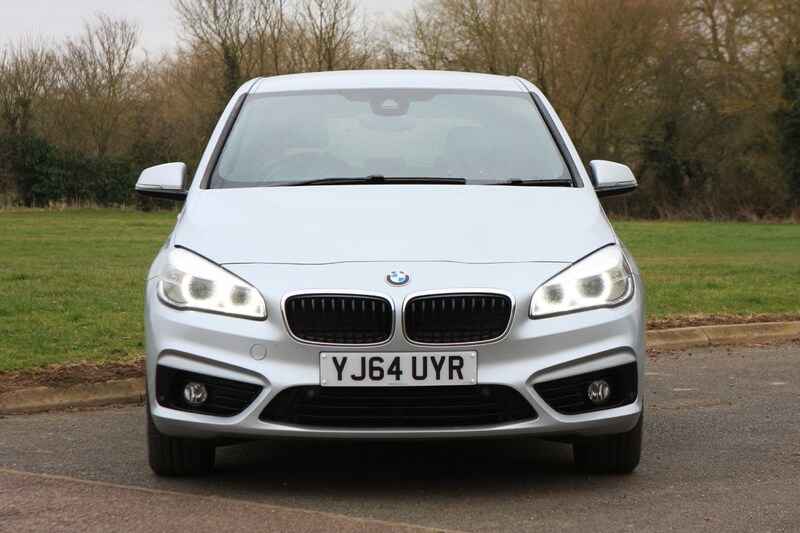 Mild styling updates along with more equipment, two new colours, and engine and gearbox updates. 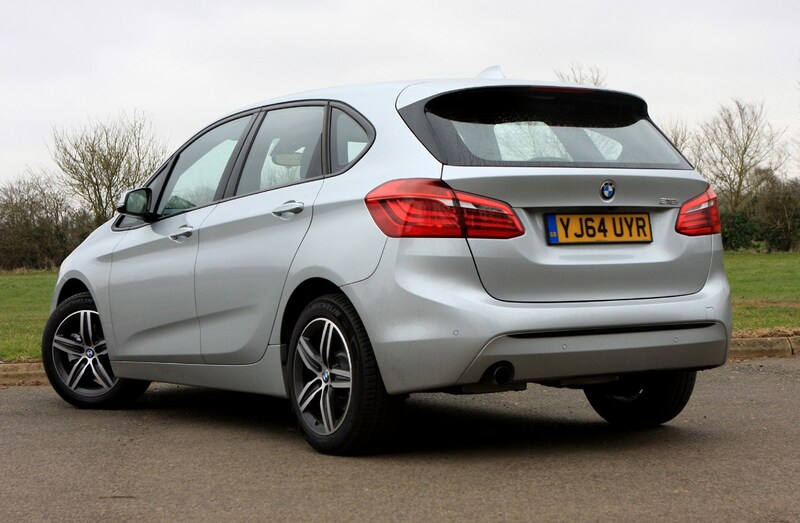 In reality, while the hybrid version has its appeal in terms of very low running costs, for most buyers we think a 218i will be all they really need. 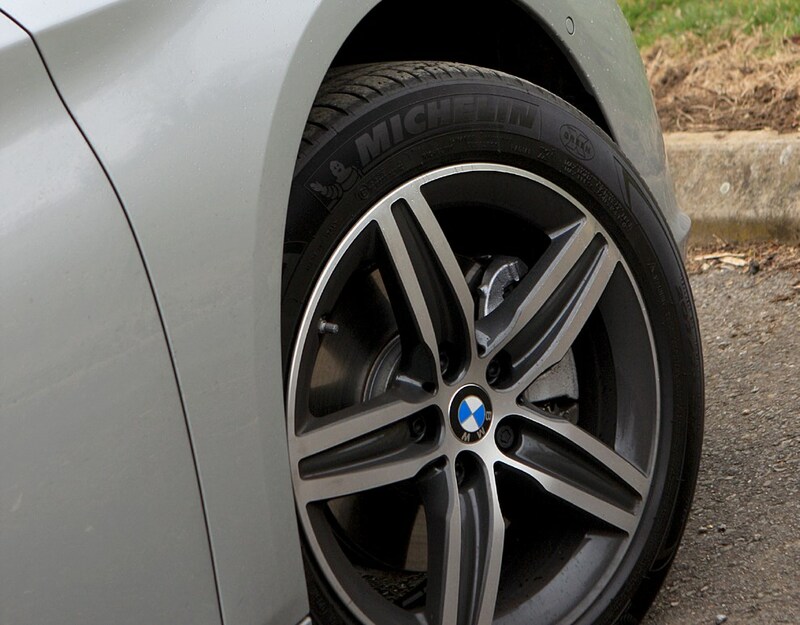 It’s perky enough and much cheaper to buy. 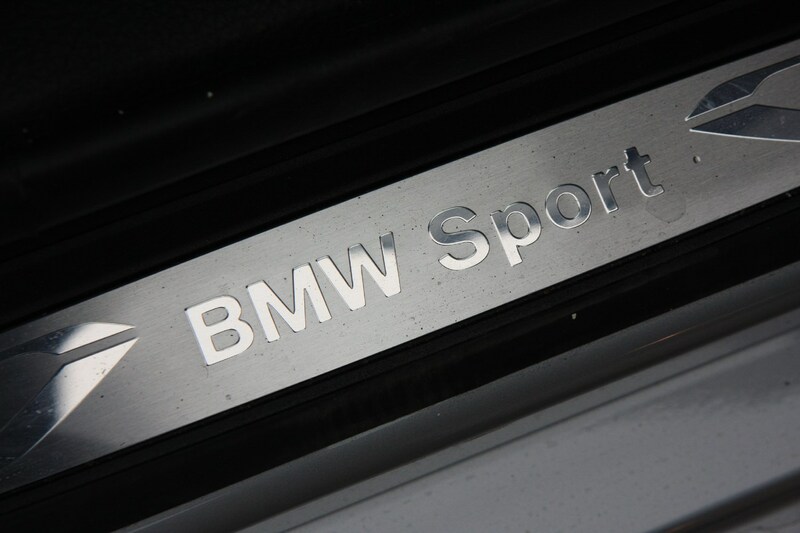 Buyers of the 225xe model (or any other high-spec powertrain) are more likely to plump for M Sport specification. 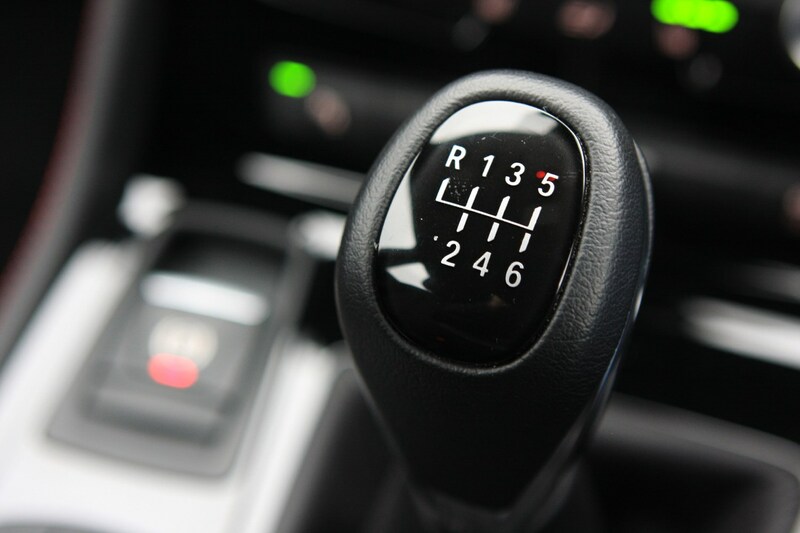 We’d expect your experience buying new will be a good one in terms of customer service, but you’re less likely to get anything resembling a discount. 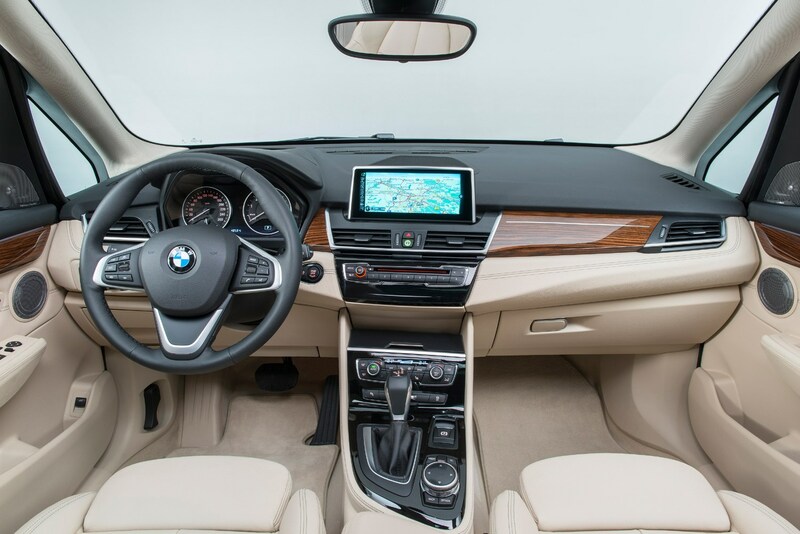 It could be worth looking at brokers or online car supermarkets, but you’ll be limited to what options they’ve decided to order with the car. 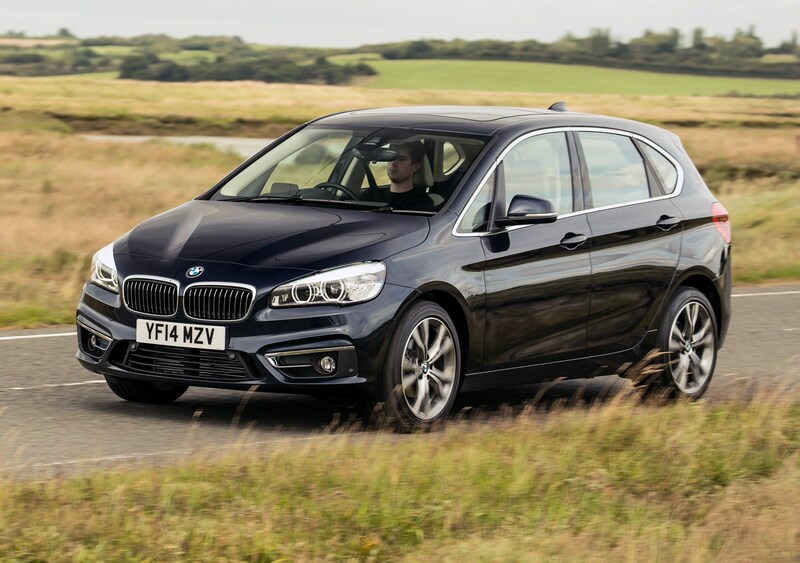 BMW occasionally offers favourable PCP finance deals on its models, and at present the 216d Active Tourer can be had with 2.9% APR including a £1,816 deposit contribution. 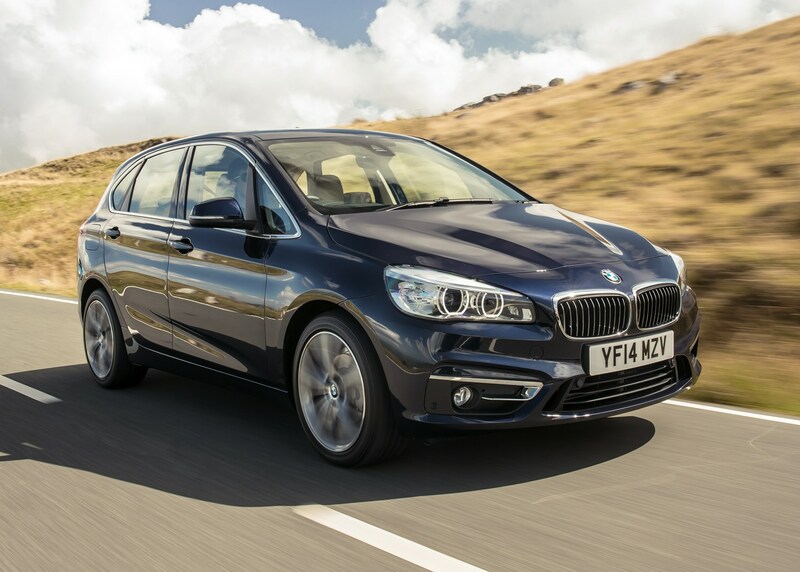 This is the first BMW compact MPV, and despite that premium blue and white roundel on the nose, there’s a good chance it has been used hard by (growing) families. 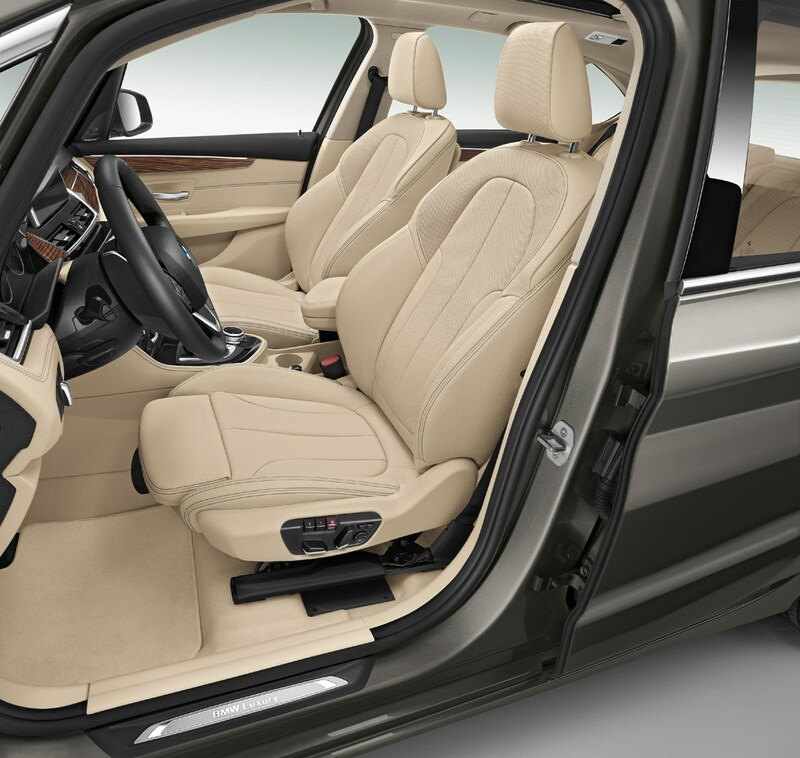 As such the interior could have had a kicking – literally – so it’s worth ensuring all the trim and seat material is free from damage. 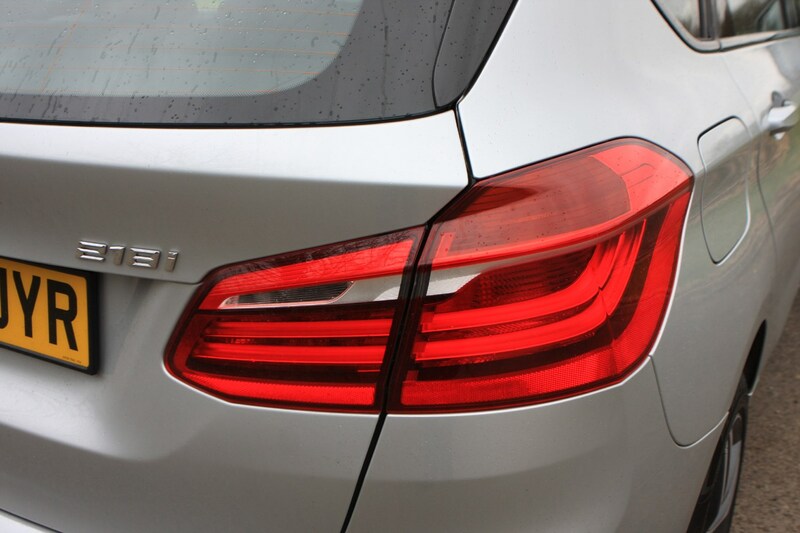 Dirt should clean off, though any competent seller will have done this before advertising the car. 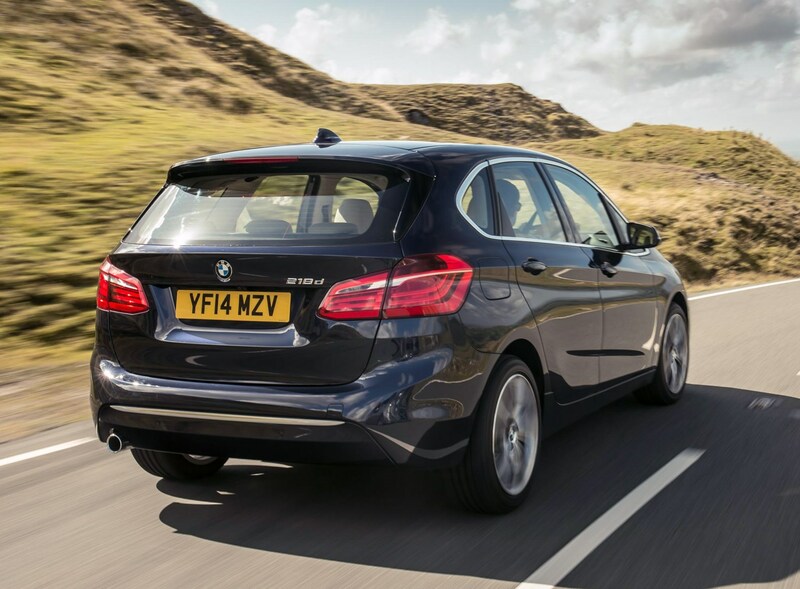 The firm also expects plenty of 2 Series Active Tourers will be snapped up by the fleet market, especially those looking for a more practical alternative to the 1 Series Sports Hatch, so high mileages won’t be uncommon. 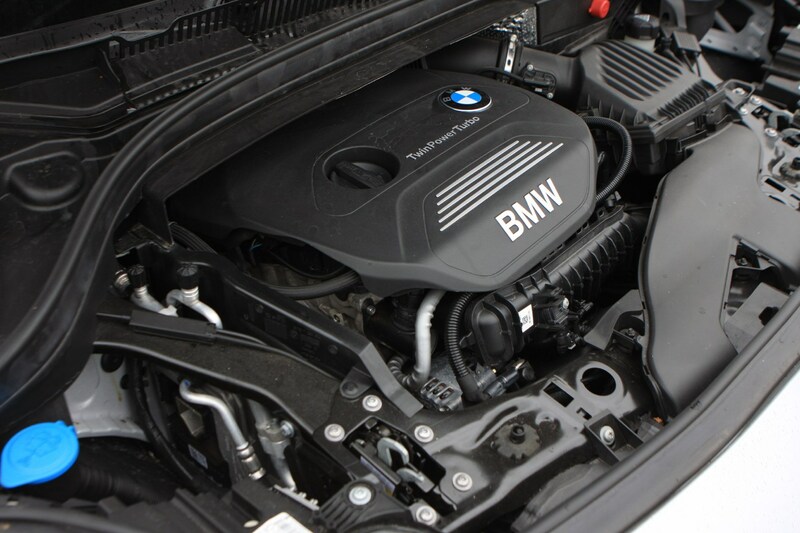 However, at least any fleet vehicles will have seen a dealer regularly for servicing and maintaining – if it hasn’t then question why not. 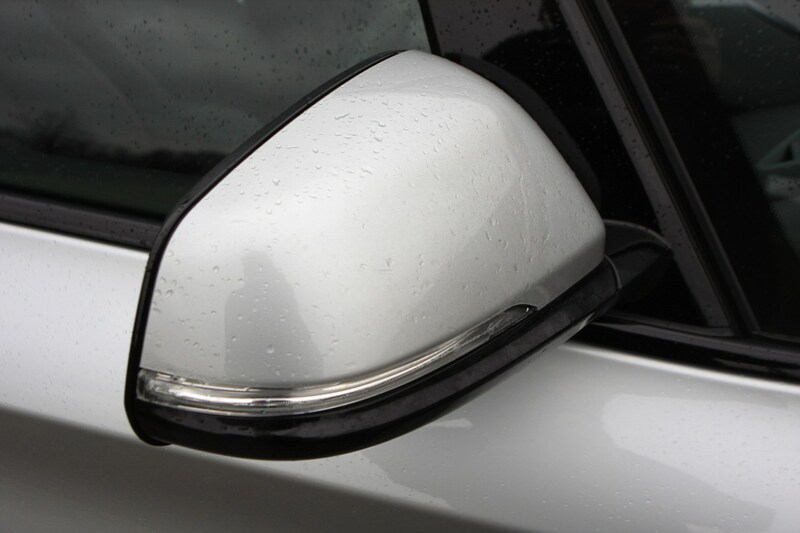 Whatever you do, ensure you invest in a Parkers Car History Check, just in case the car you are looking at is hiding a dark past. 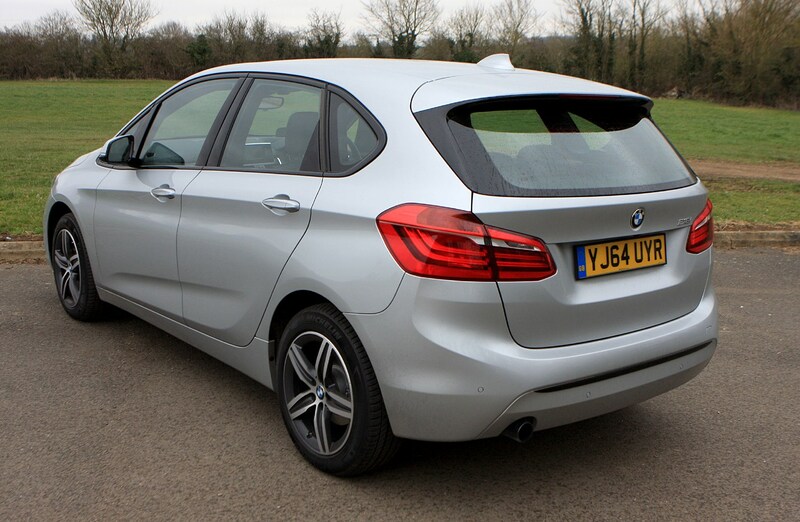 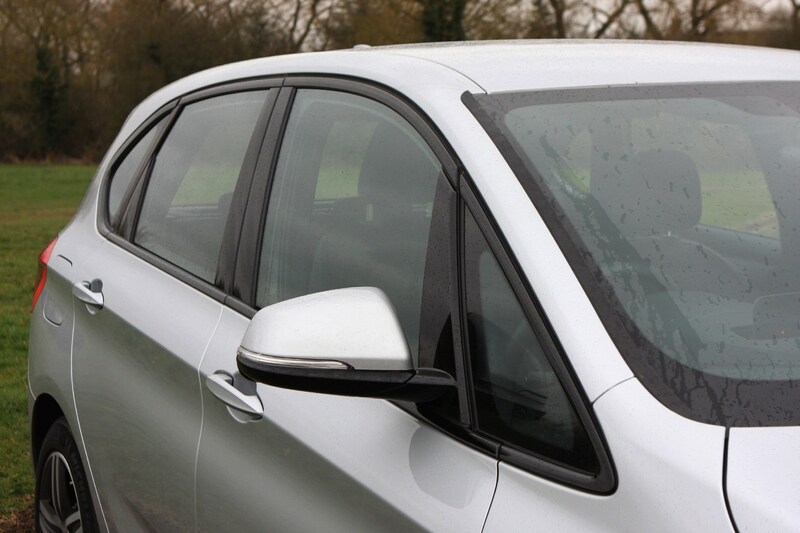 Thanks to its high levels of standard equipment, even entry-level cars will be desirable on the used market, though some extra kit will entice buyers – things like the M Sport trim or the panoramic roof will attract, as will the navigation packages, so if you have these then your 2 Series Active Tourer will stand out from the crowd. 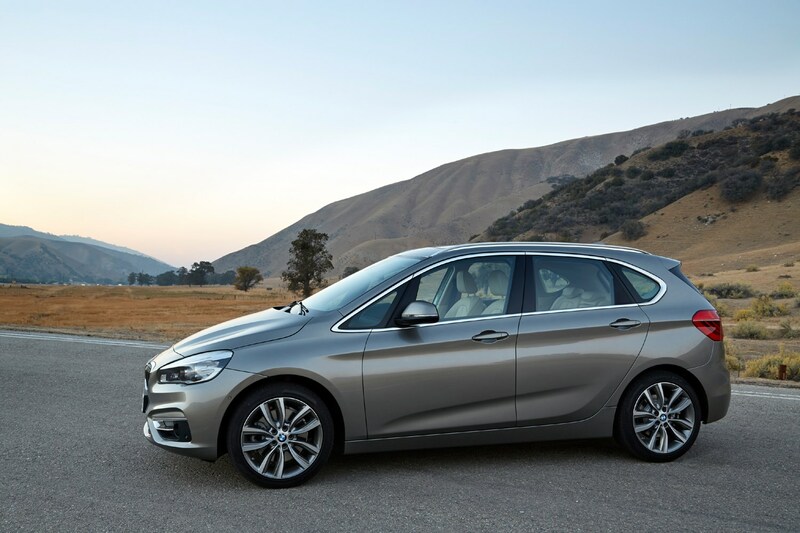 Money-conscious buyers will be on the lookout for the Service Inclusive pack (transferrable to new owners) so selecting this three-year option at time of purchase will stand you well later too. 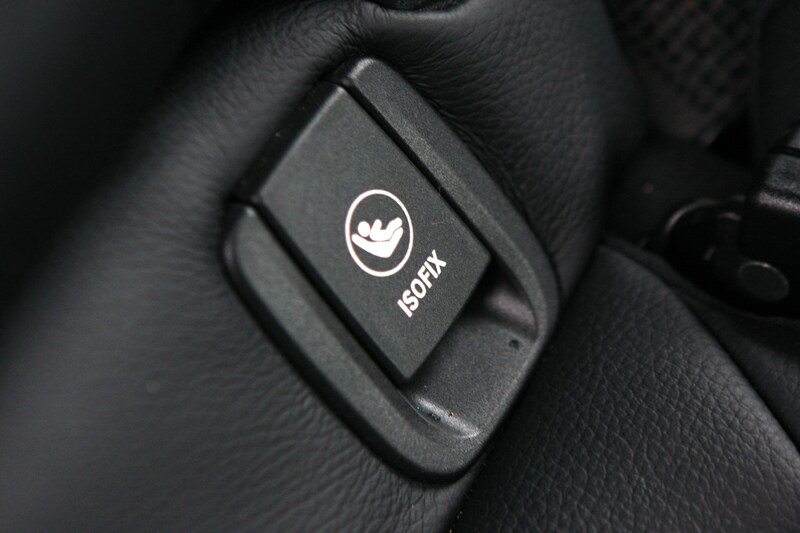 Otherwise it’s common sense; make sure the car is clean and damage free when you advertise it, and ensure the service book is fully stamped to show it has had regular maintenance. 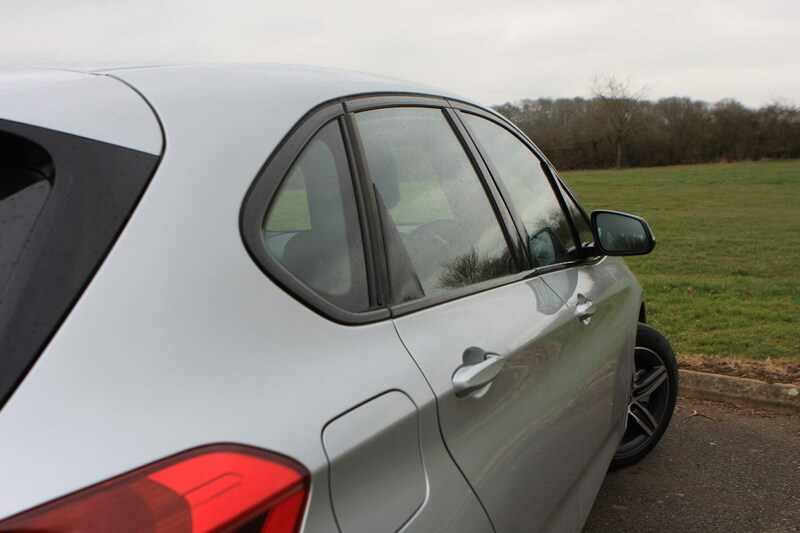 Take some clear pictures of the car and ensure you’ve carried out a Parkers Valuation to ensure you’re pricing it correctly.